My newest addition and now centerpiece of my certified autograph collection. 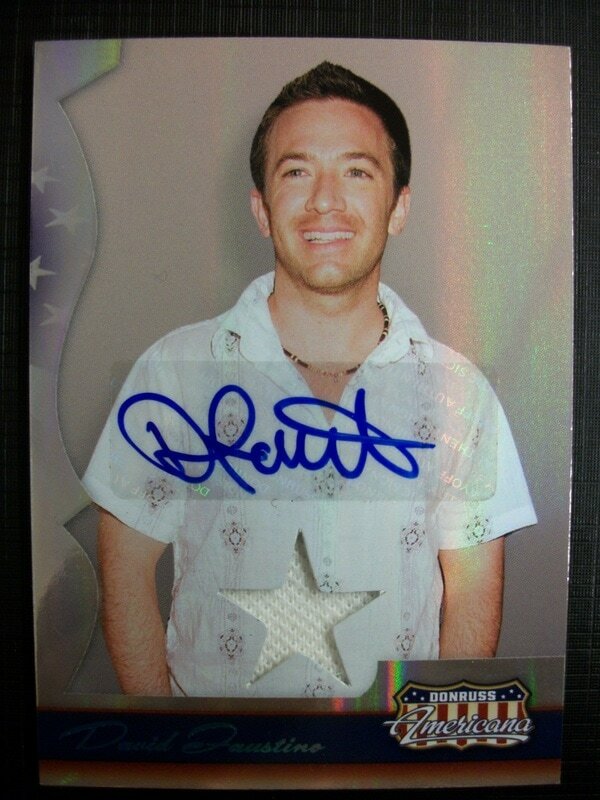 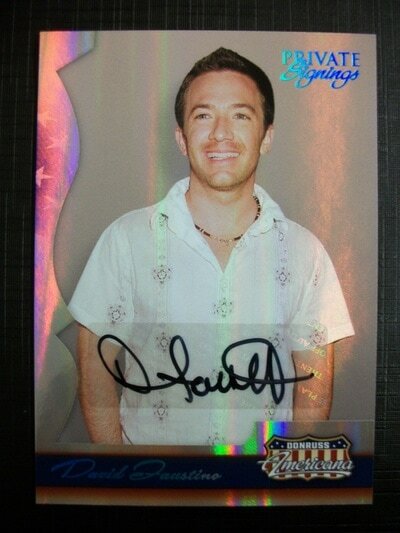 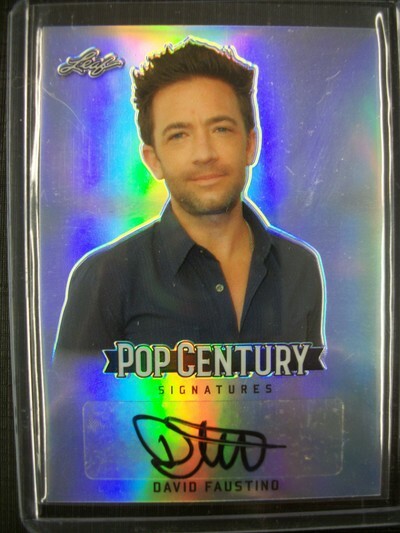 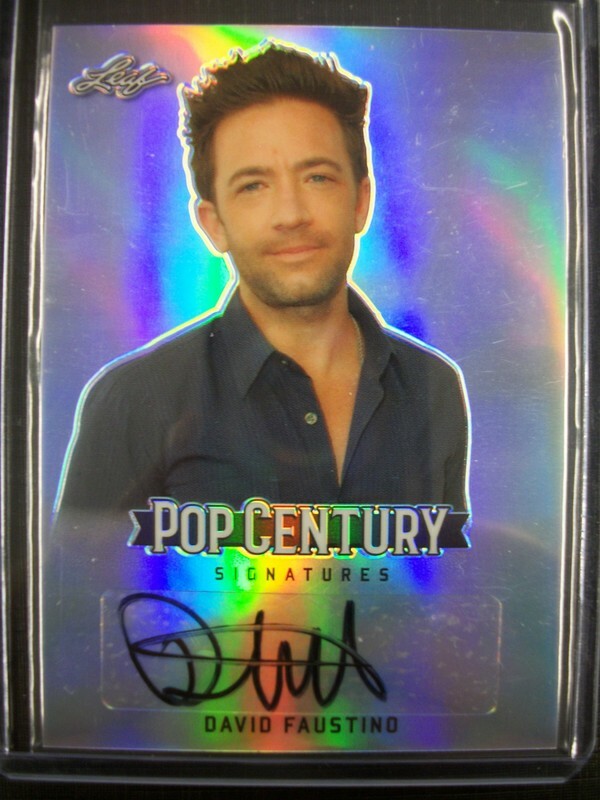 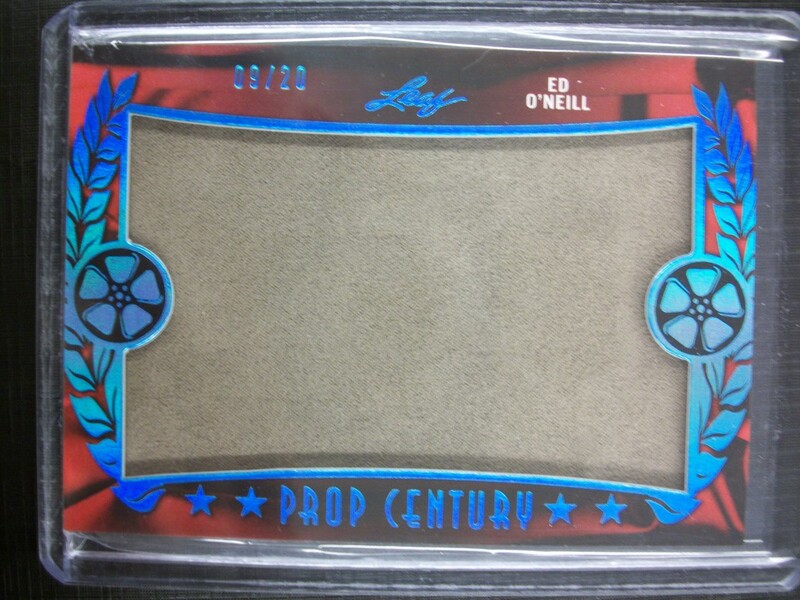 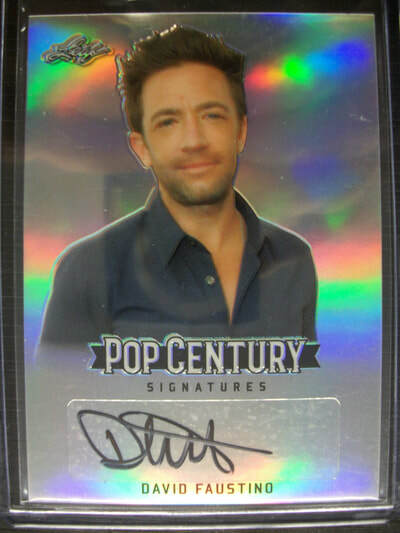 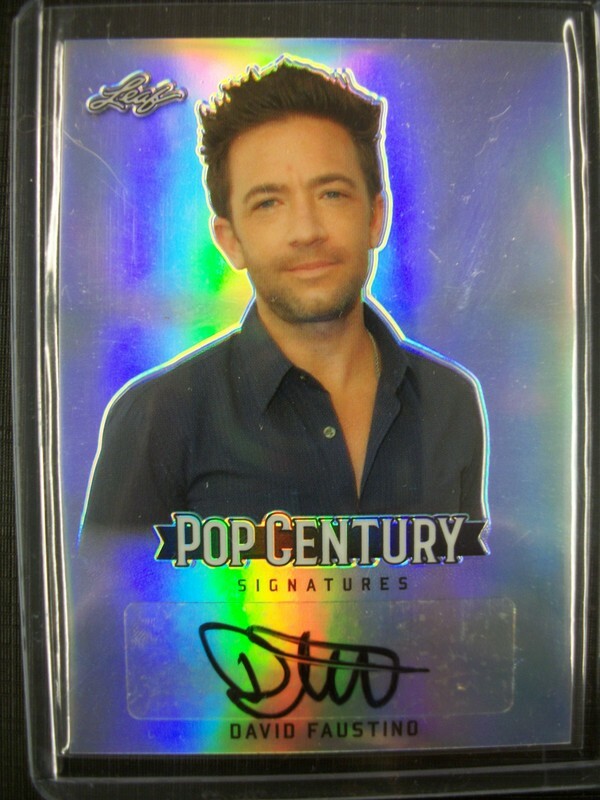 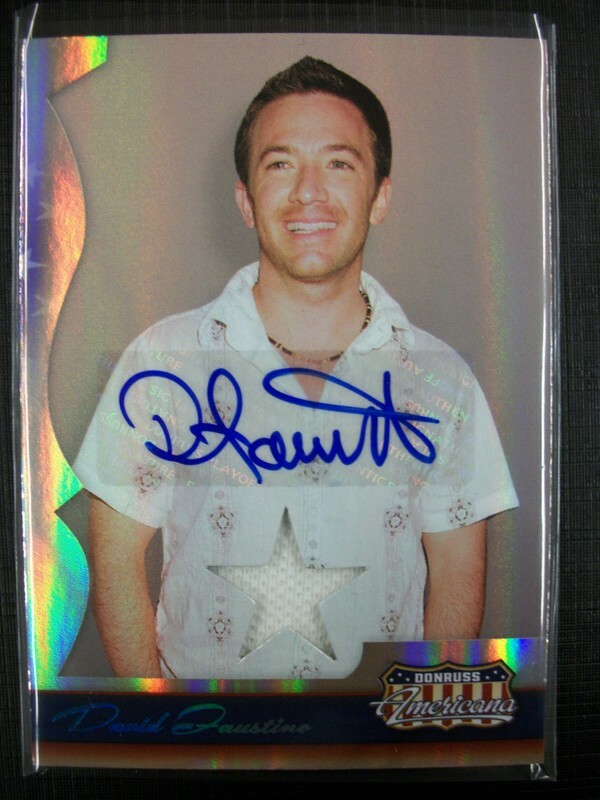 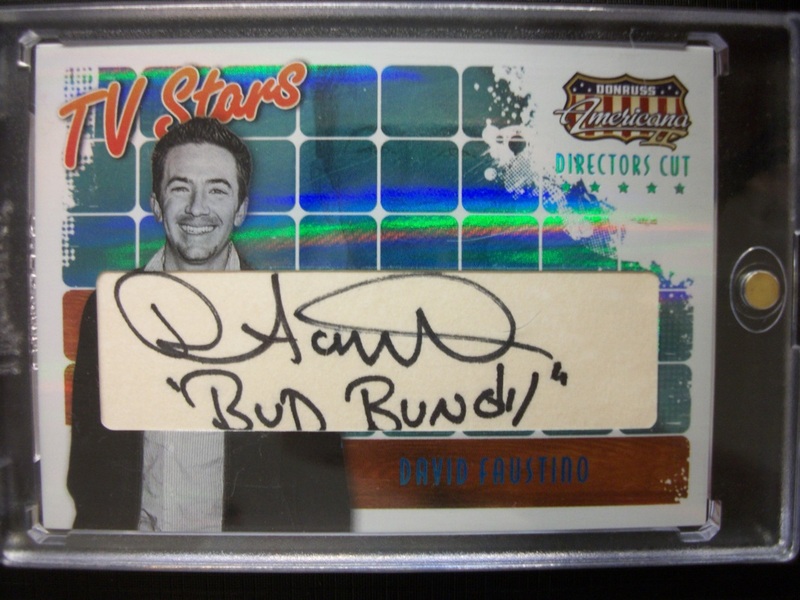 The card was released in 2009 by Donruss Americana with a print run of #/20. 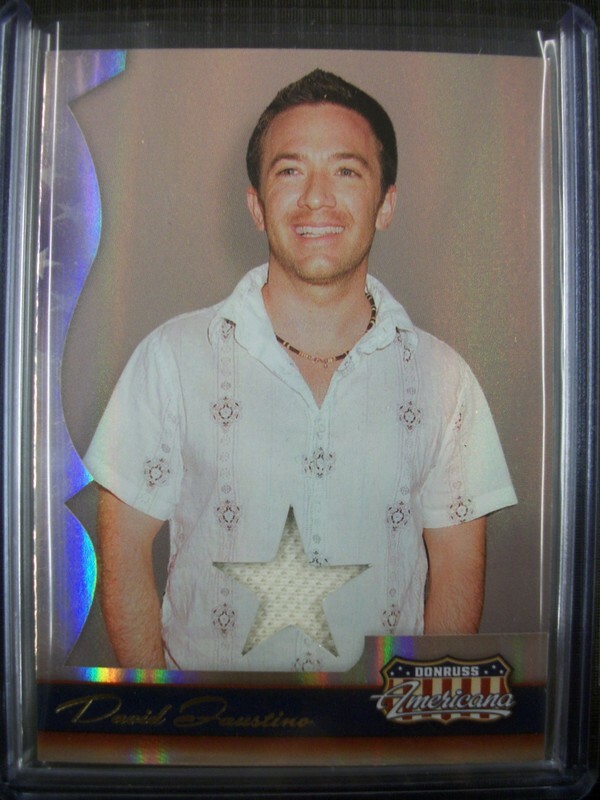 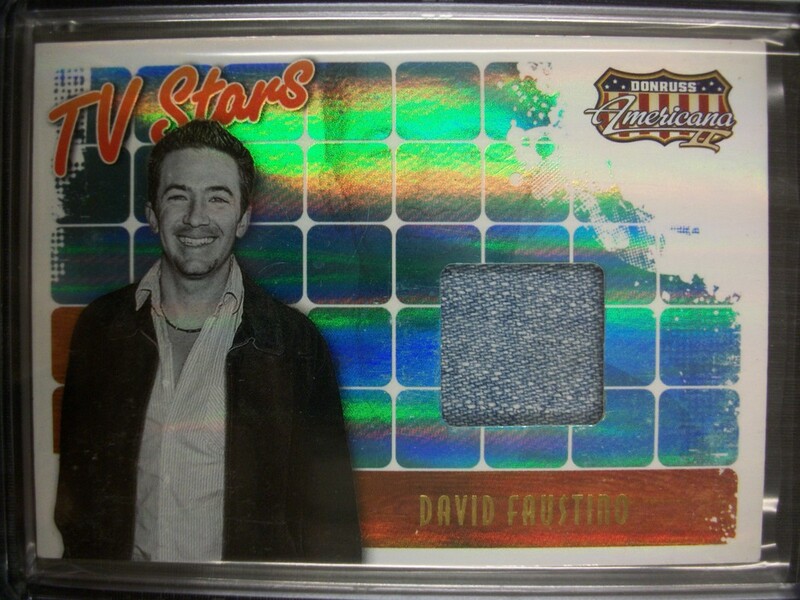 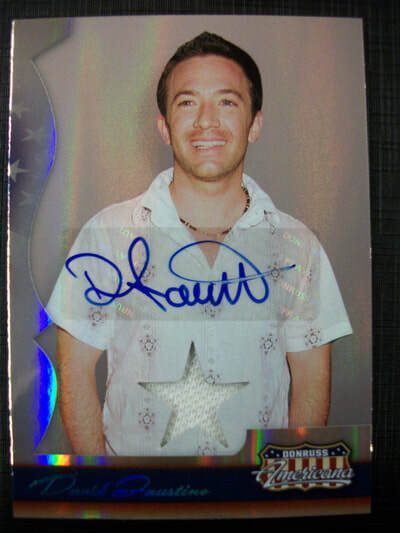 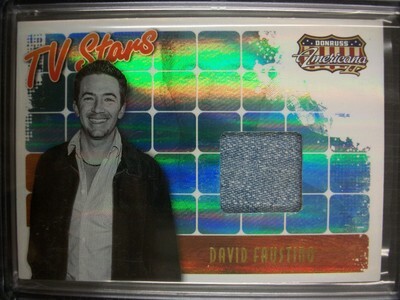 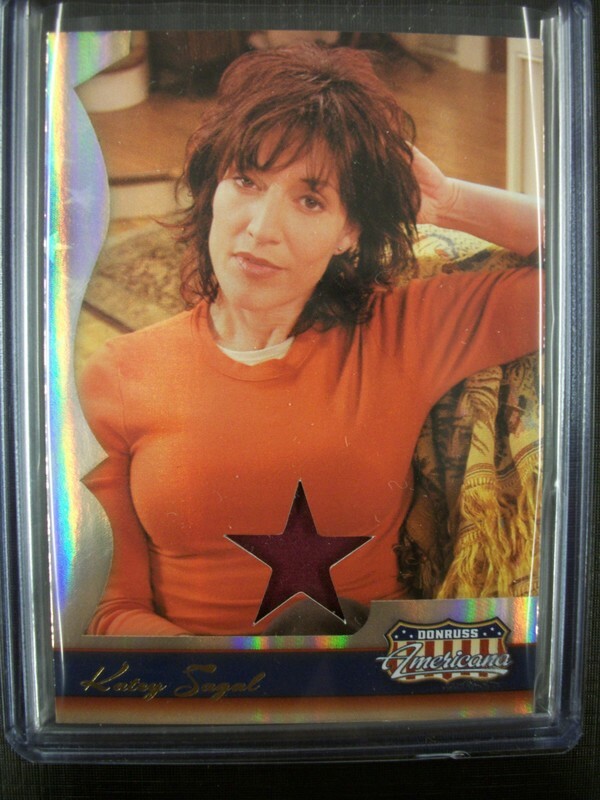 This is one of my favorite sets released from Donruss Americana back in 2008. 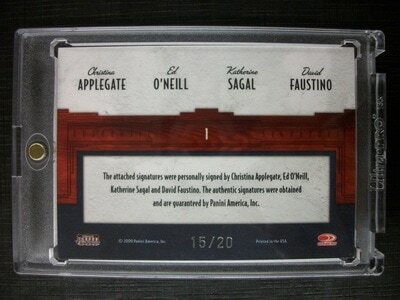 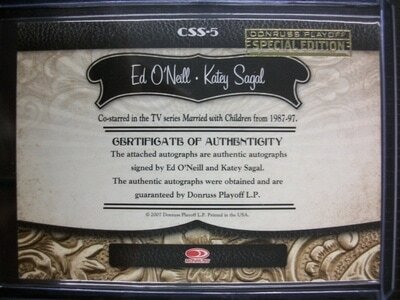 They are actually cut signatures that have show quotes and character names in different color inks. So cool that the entire cast was chosen to sign for the set. 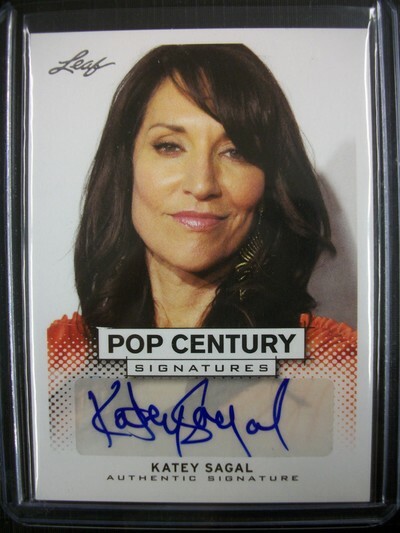 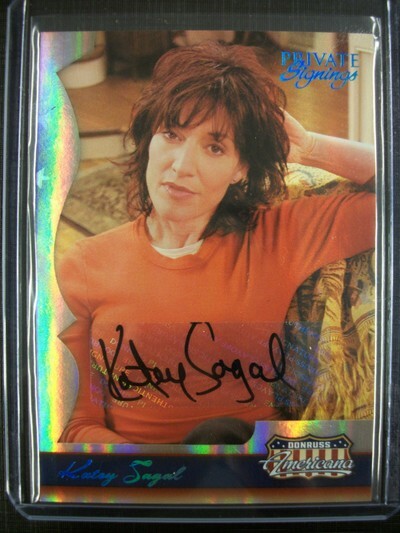 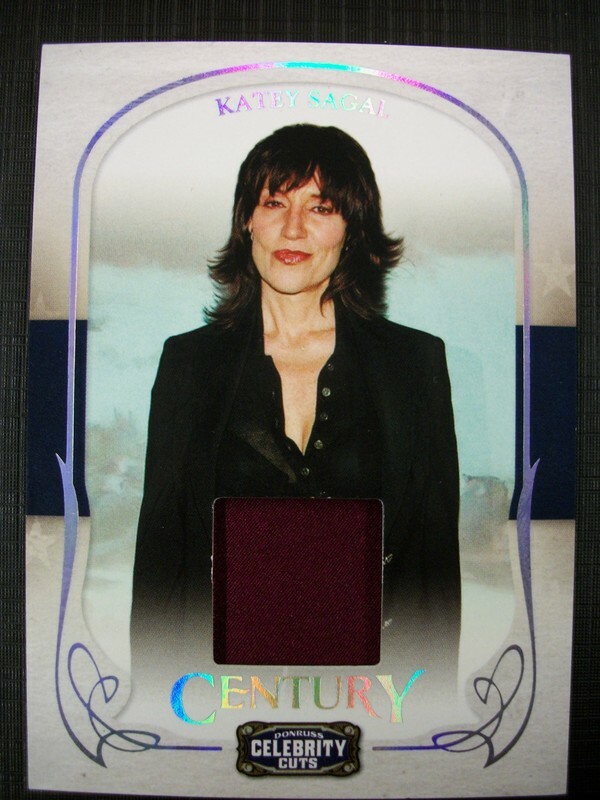 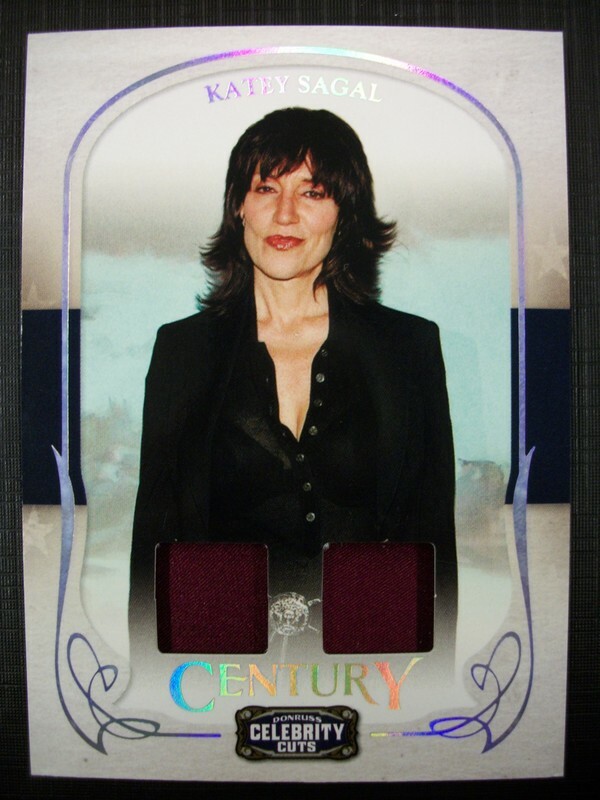 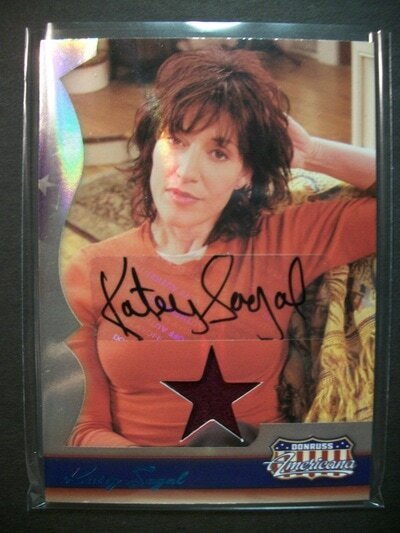 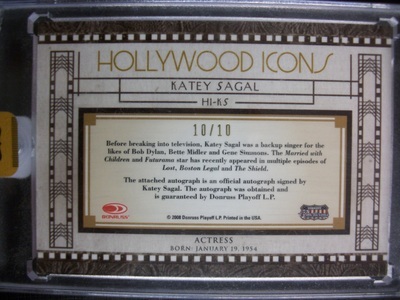 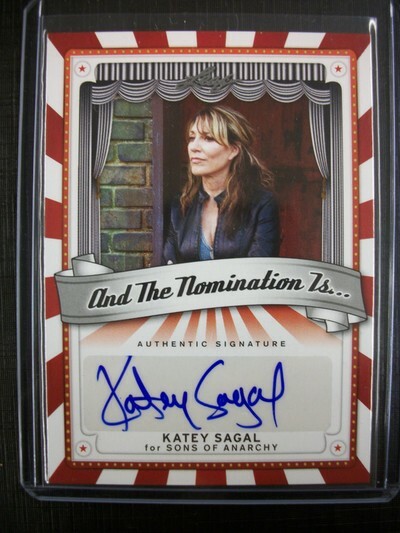 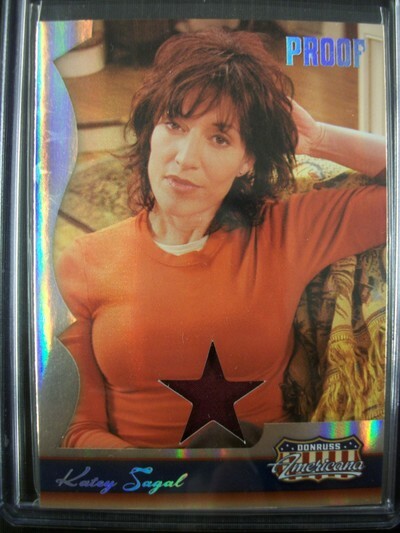 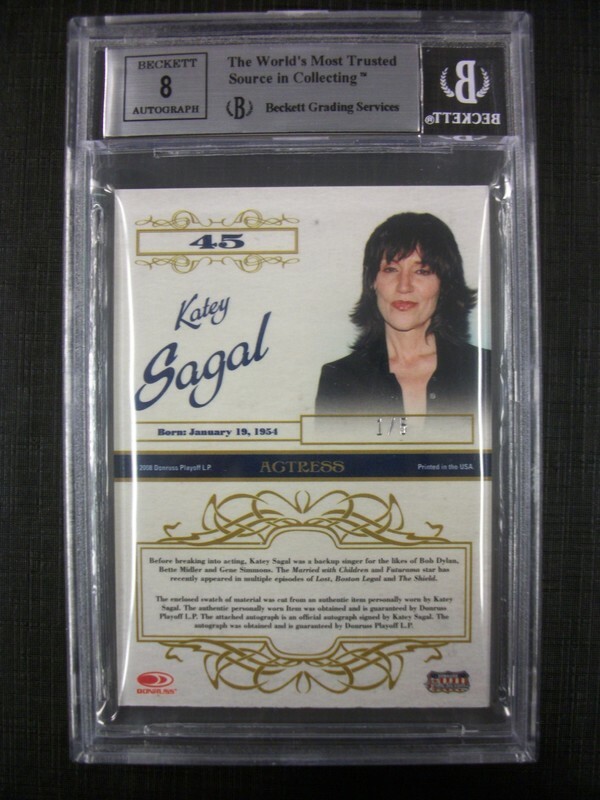 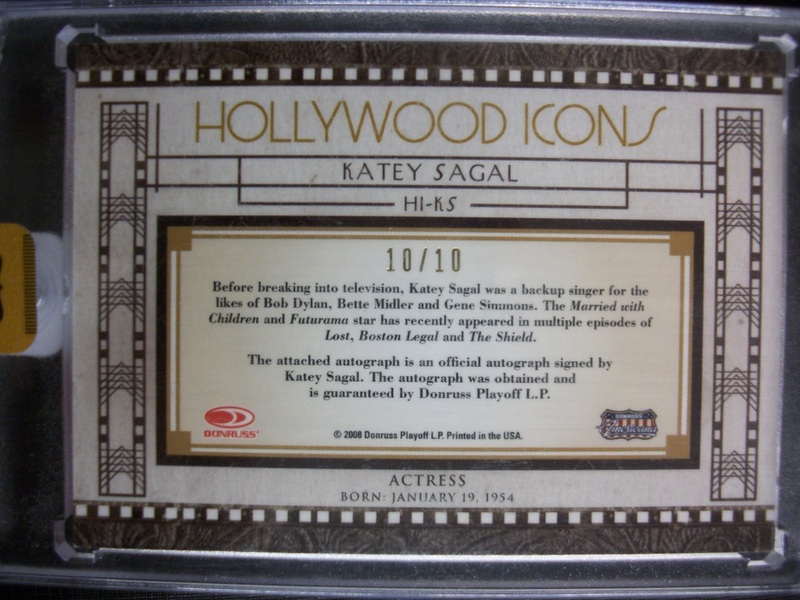 I am still in need of Katey Sagal with one of her MWC inscriptions. 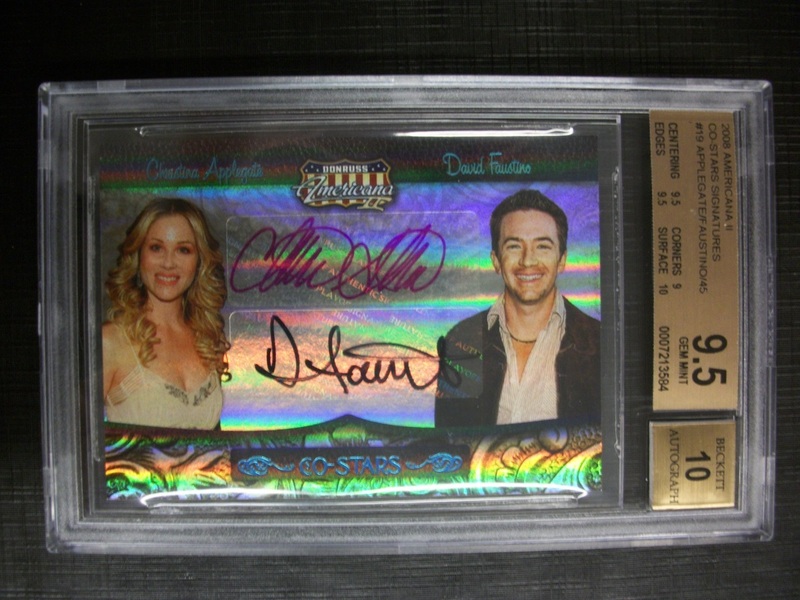 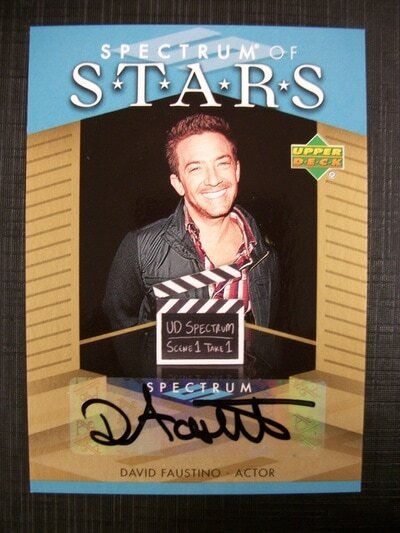 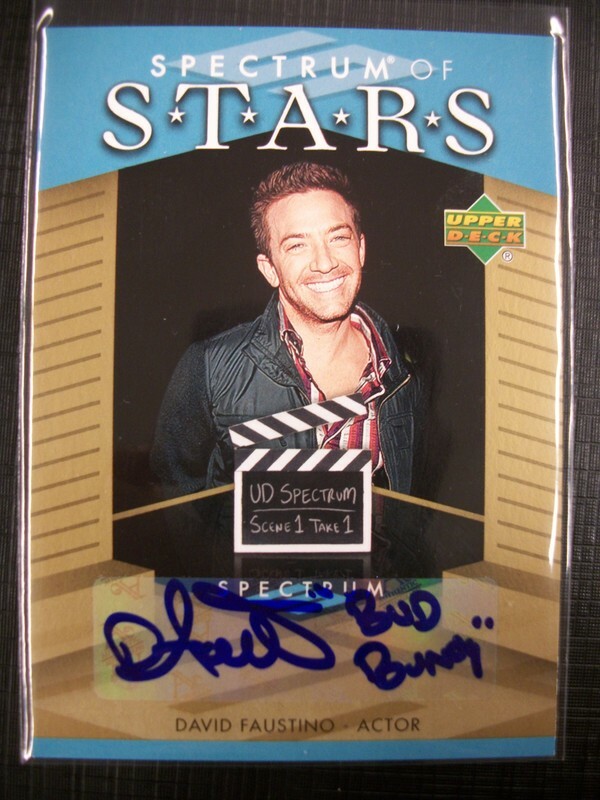 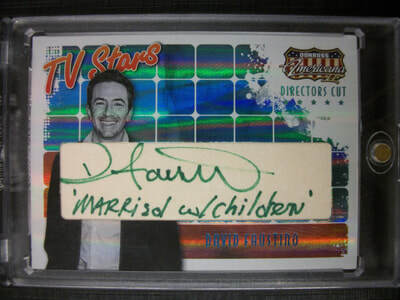 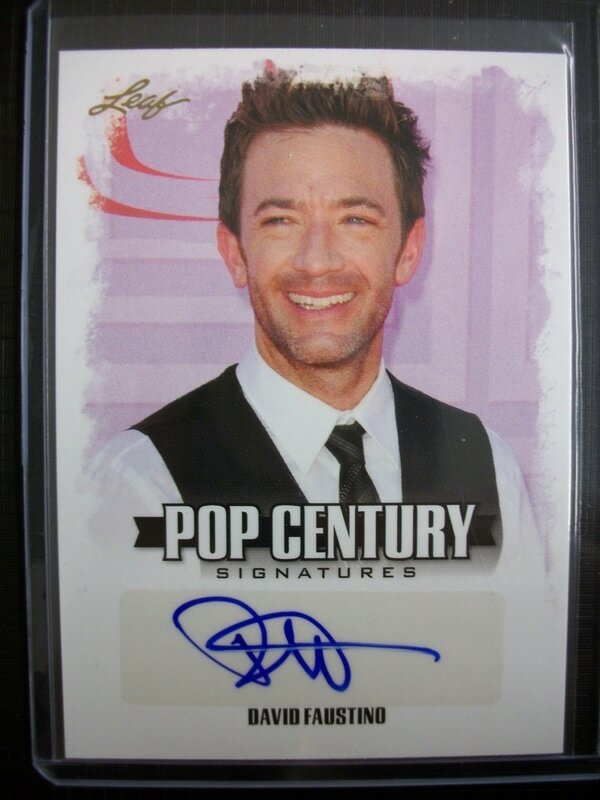 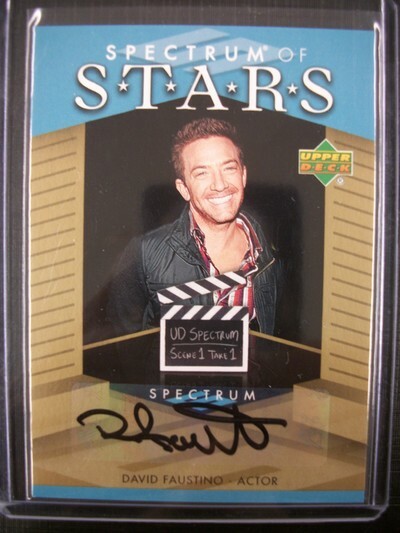 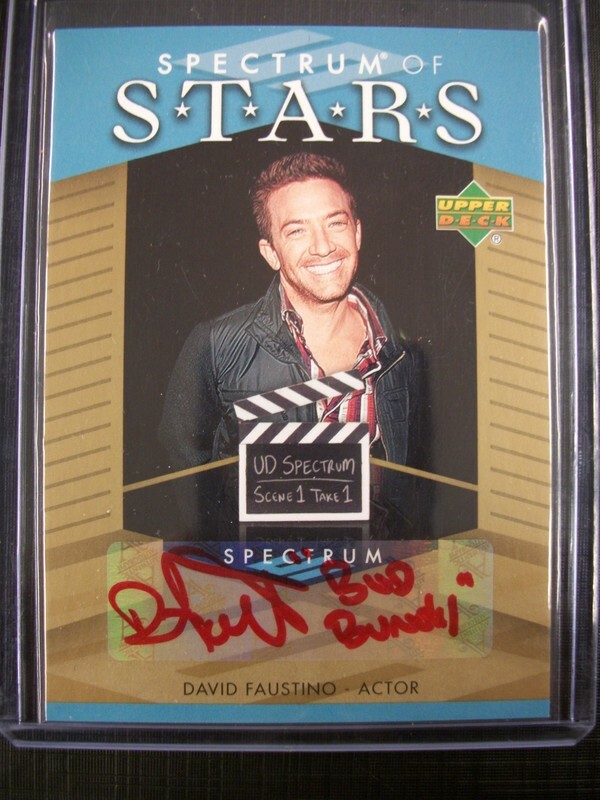 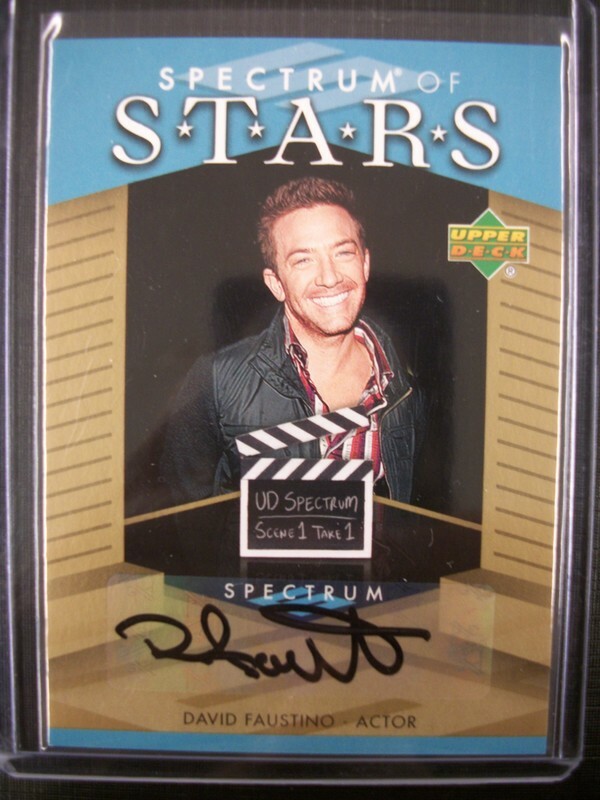 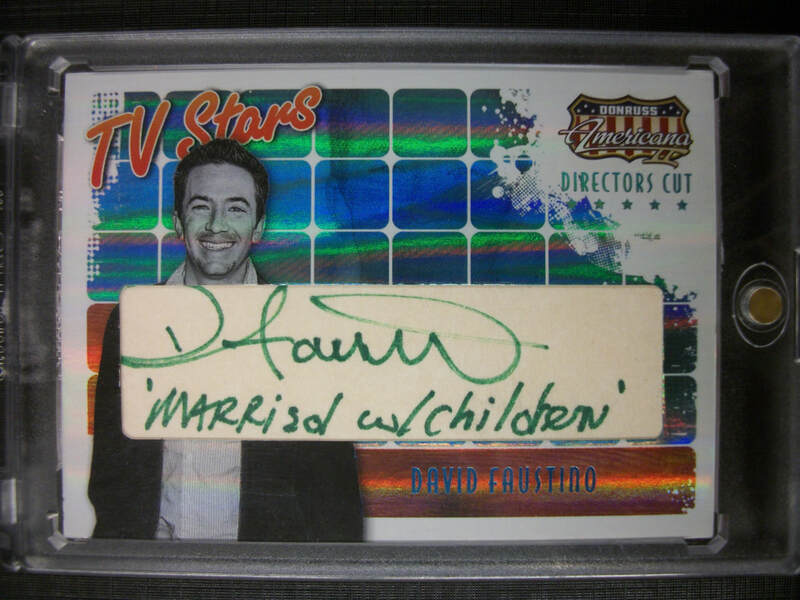 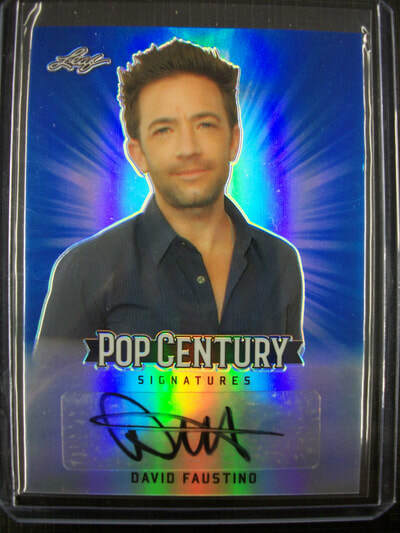 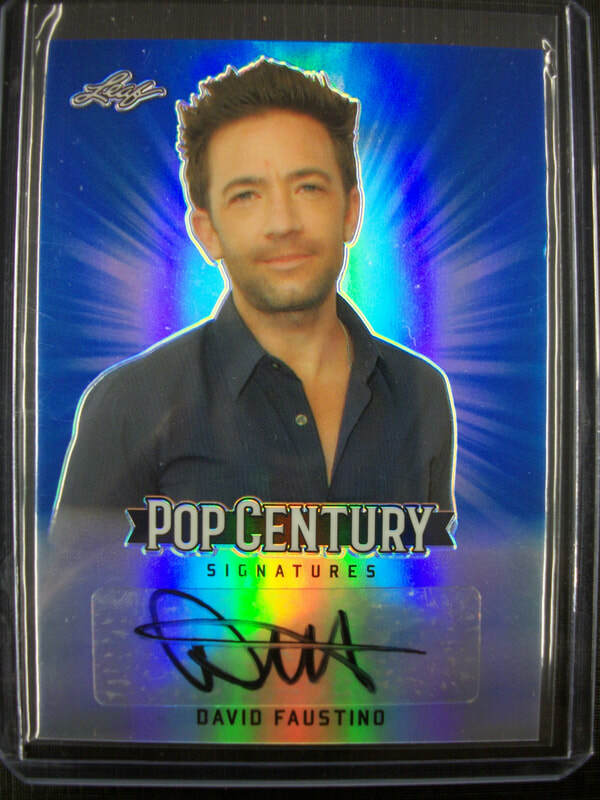 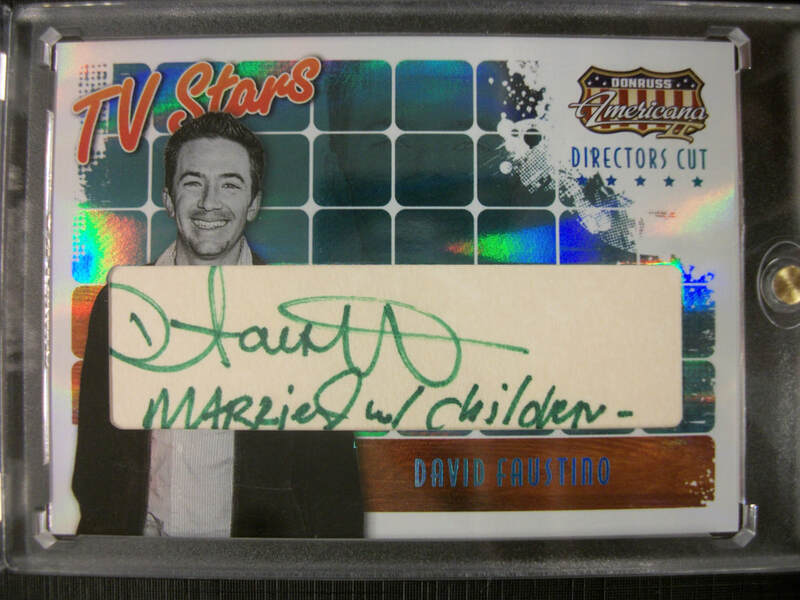 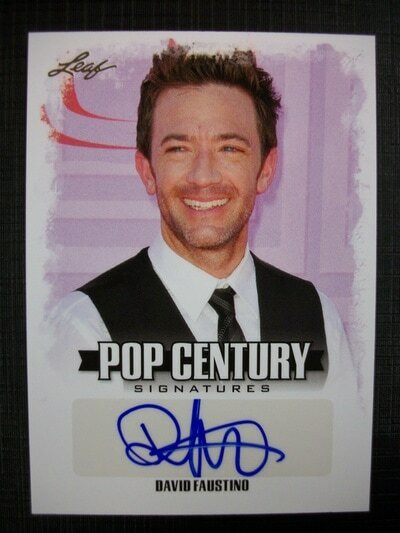 My collection of actor/actress autographed cards released througout the years. 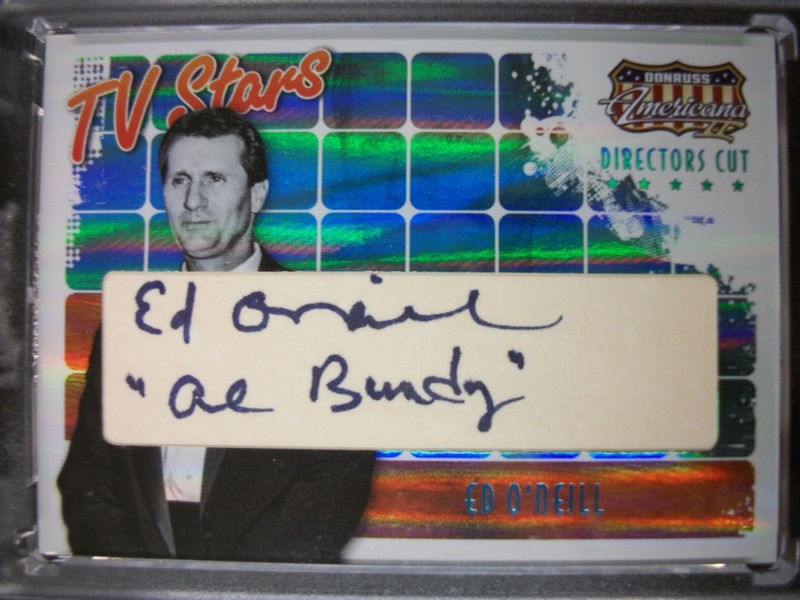 Some of these are very hard to find now. 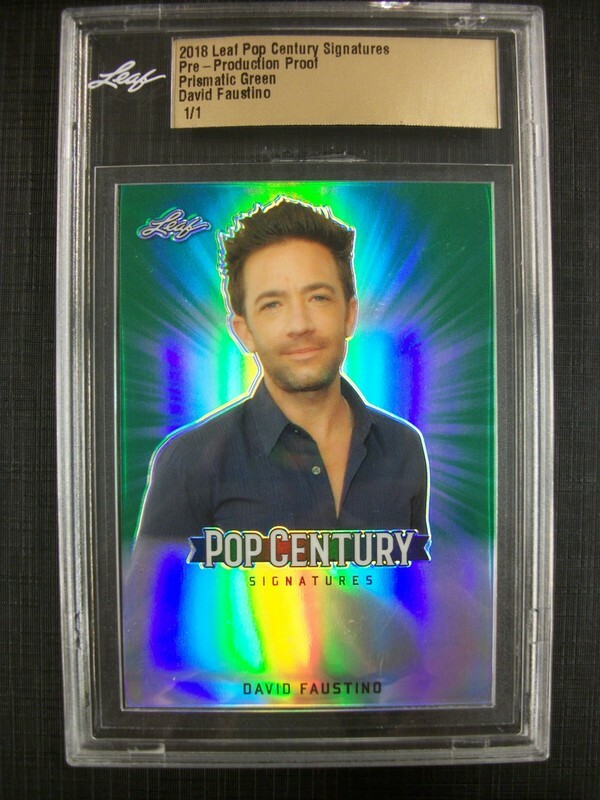 I'm always looking for versions I don't have. 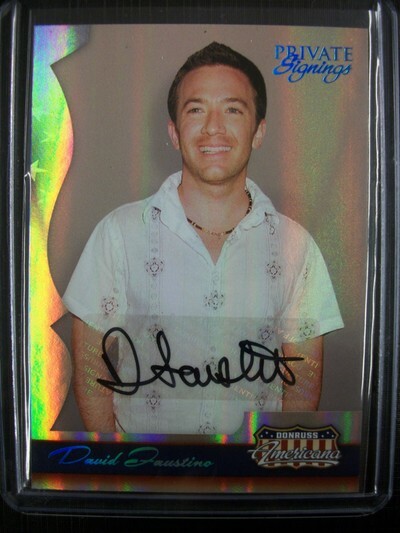 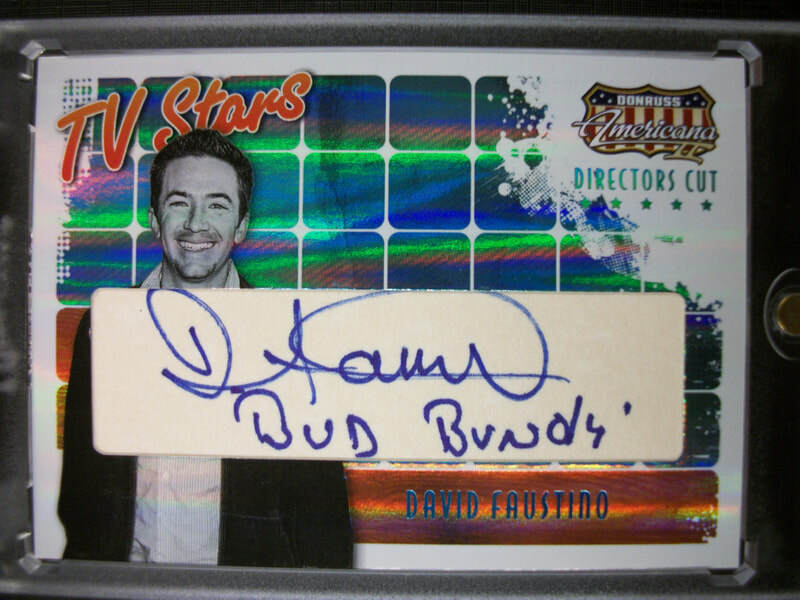 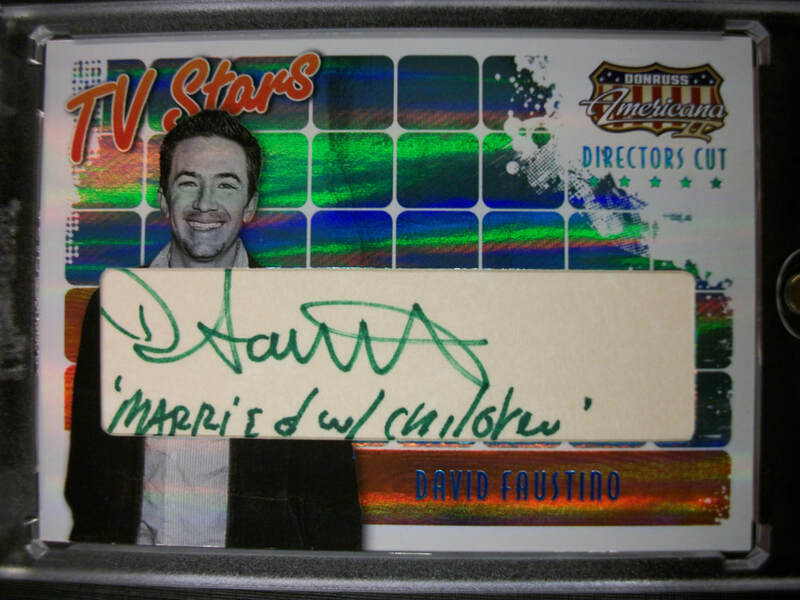 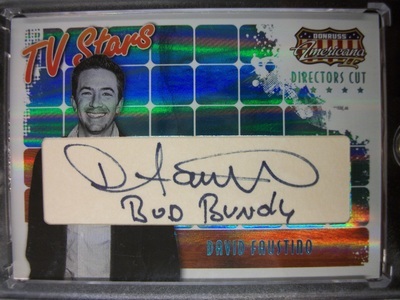 Here's a single signed card I believe was given out at one of the Nationals as it's stamped "Donruss Playoff Special Edition." 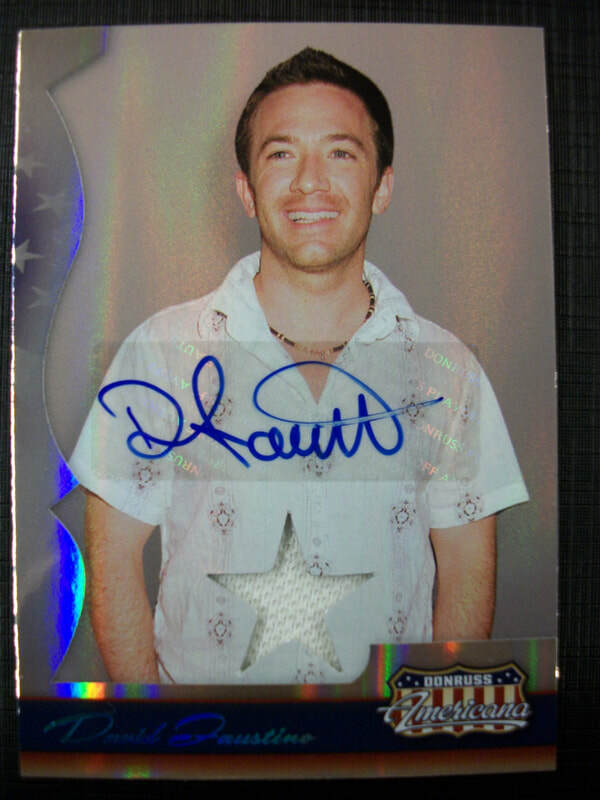 I wish I knew more about it! 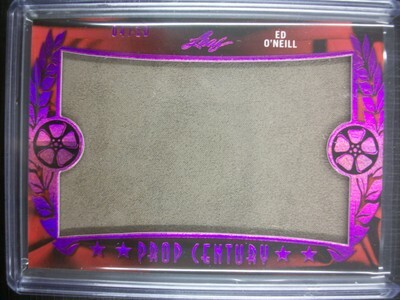 Finally able to land one of my big wants! 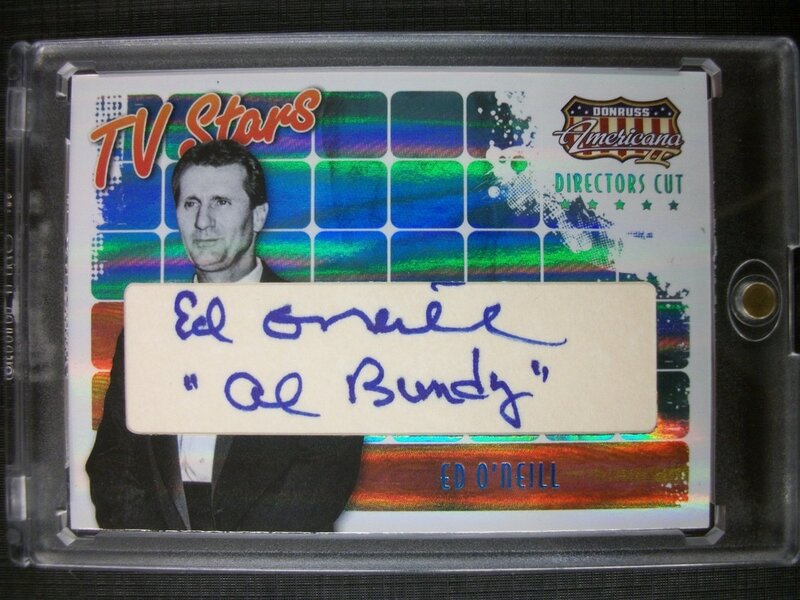 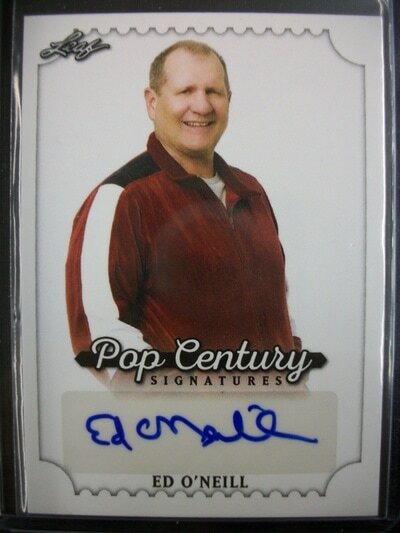 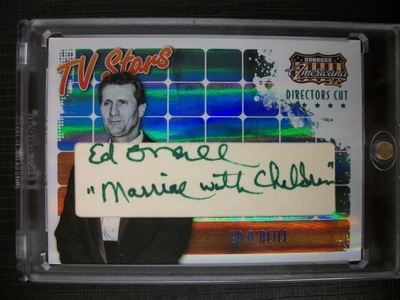 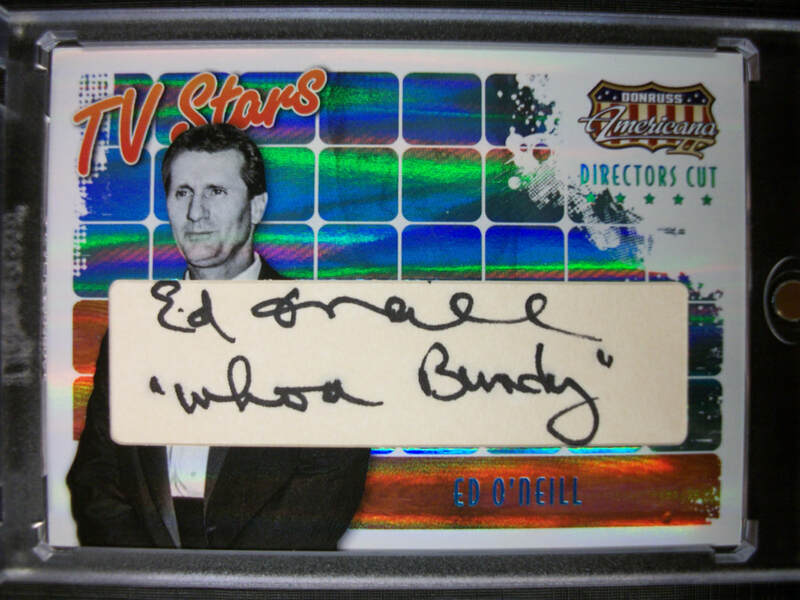 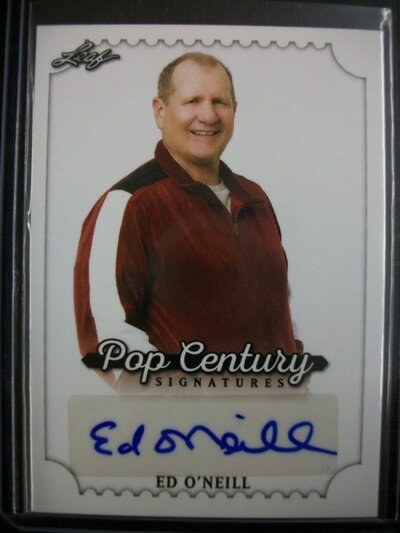 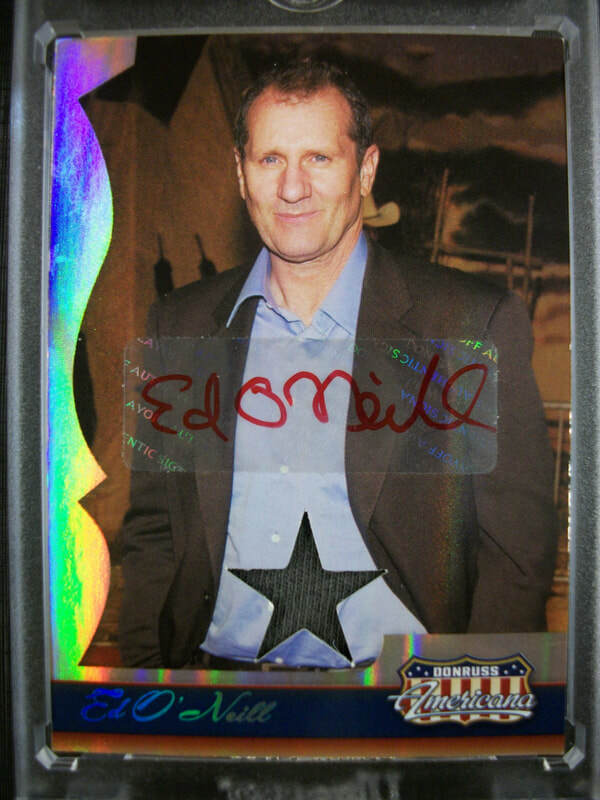 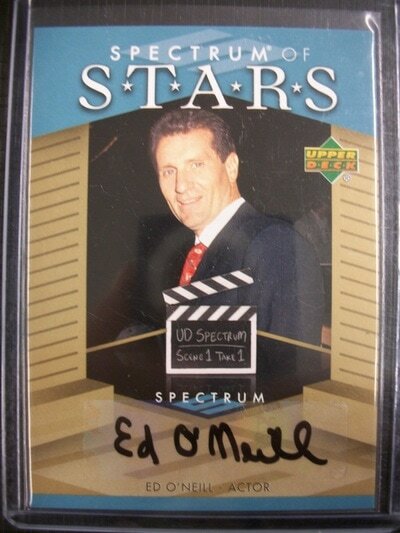 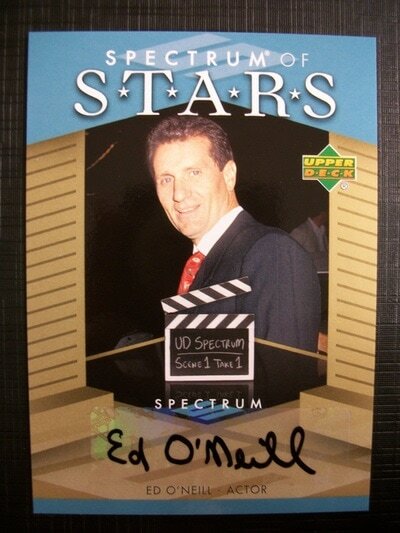 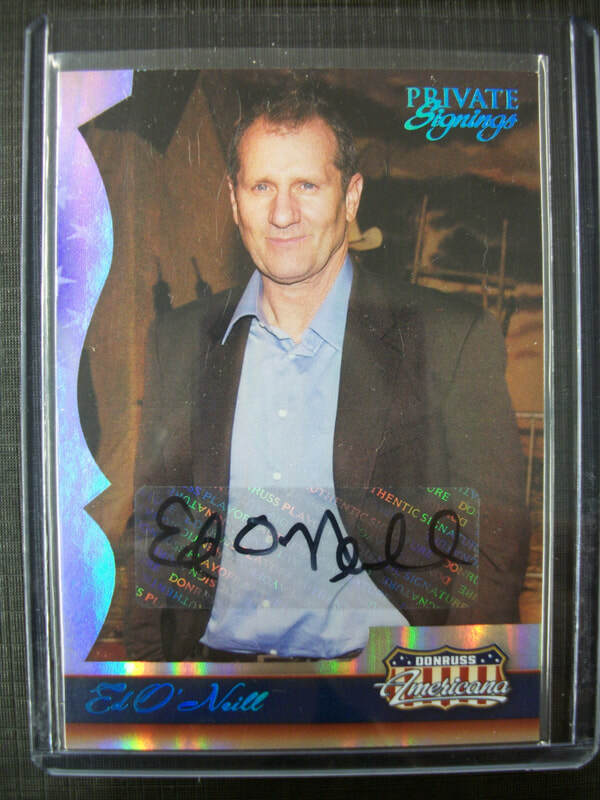 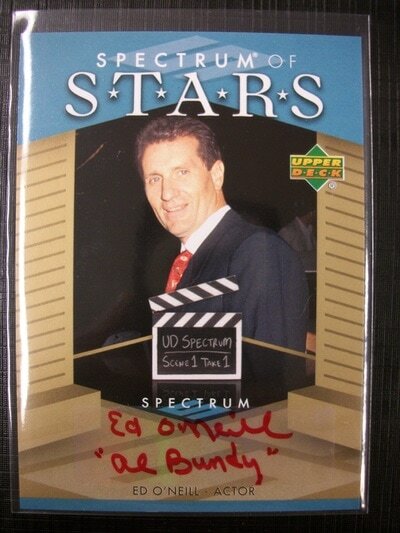 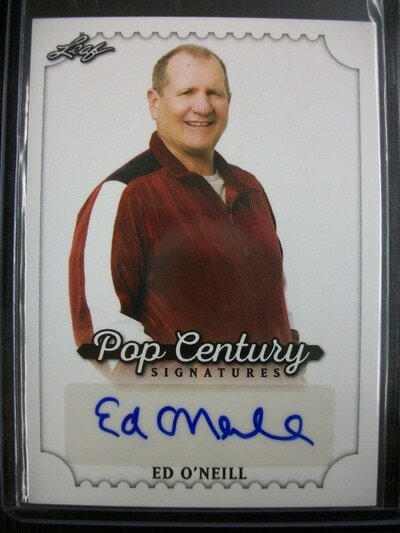 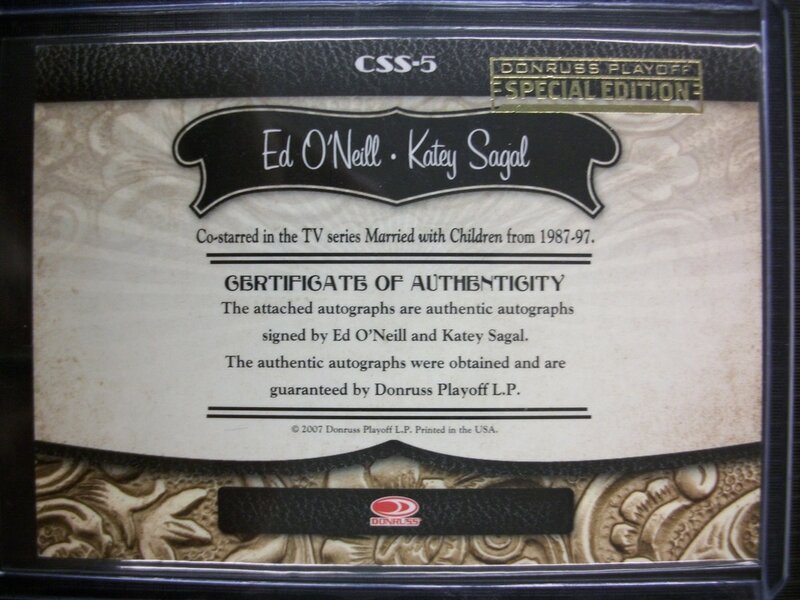 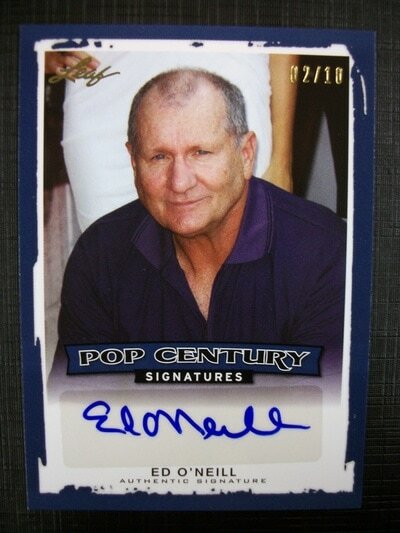 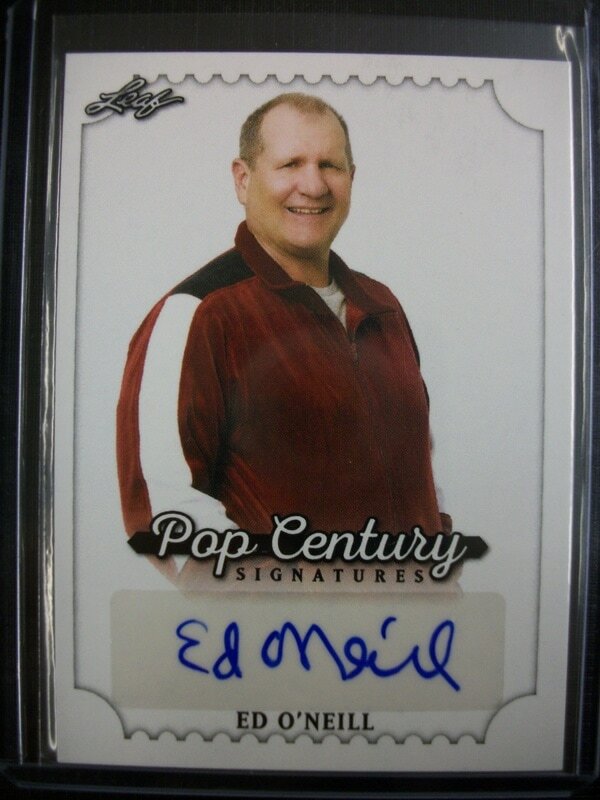 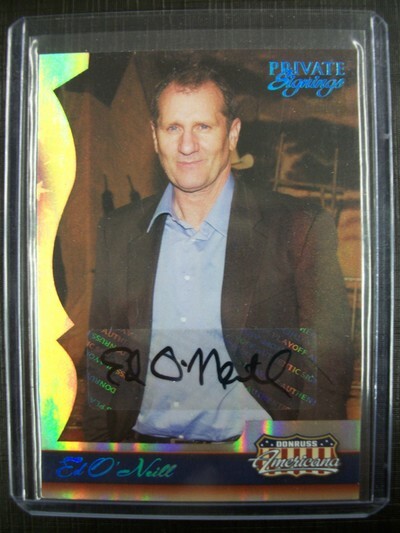 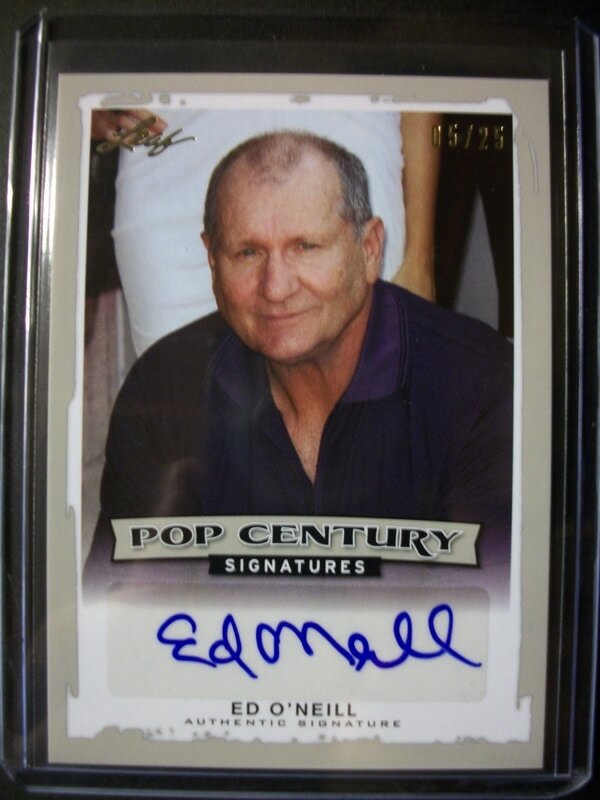 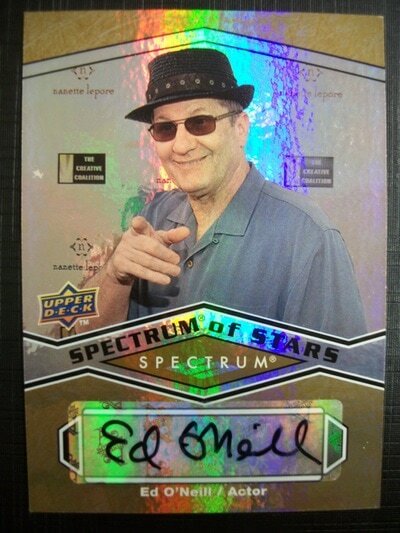 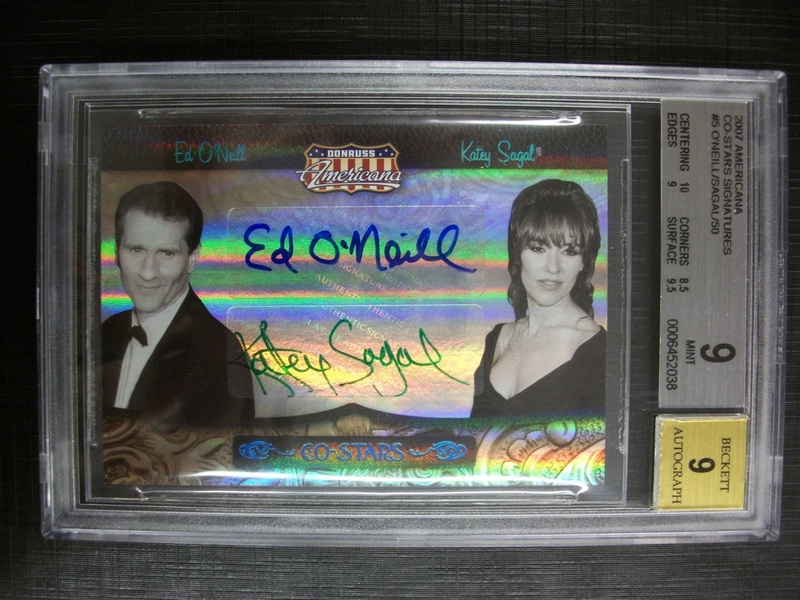 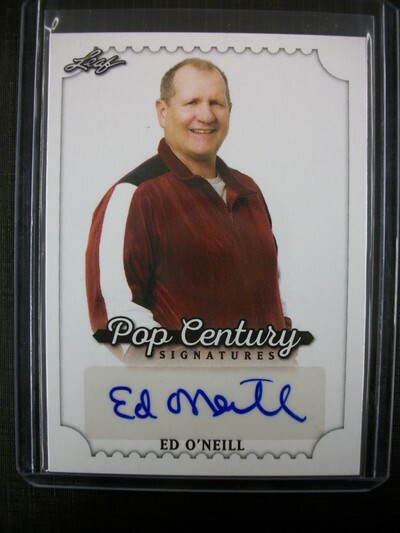 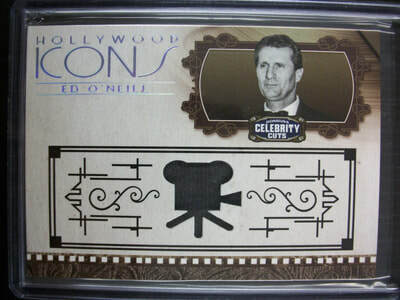 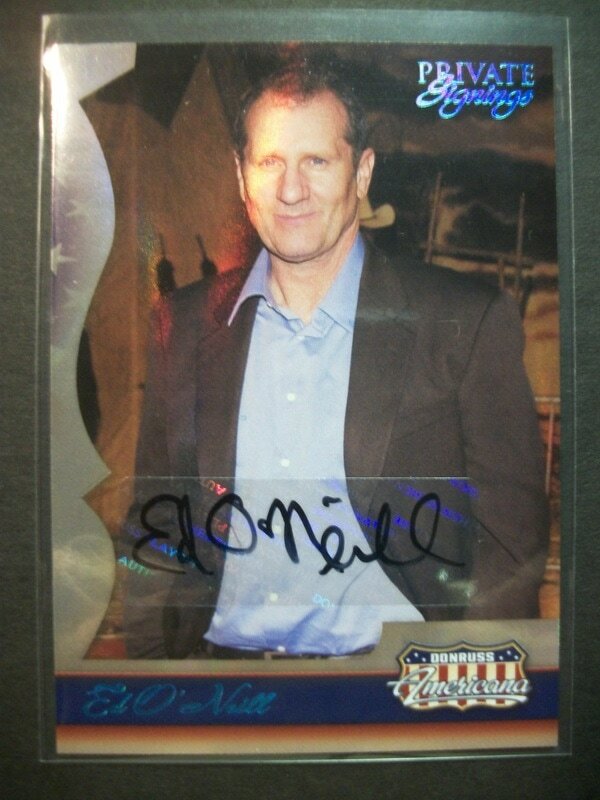 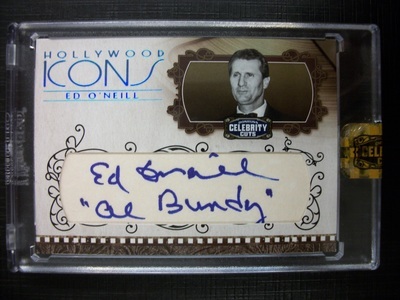 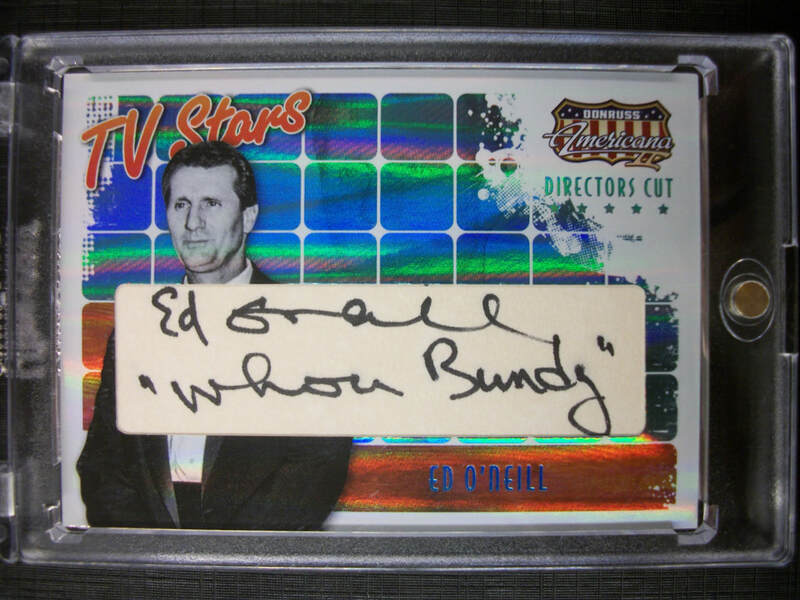 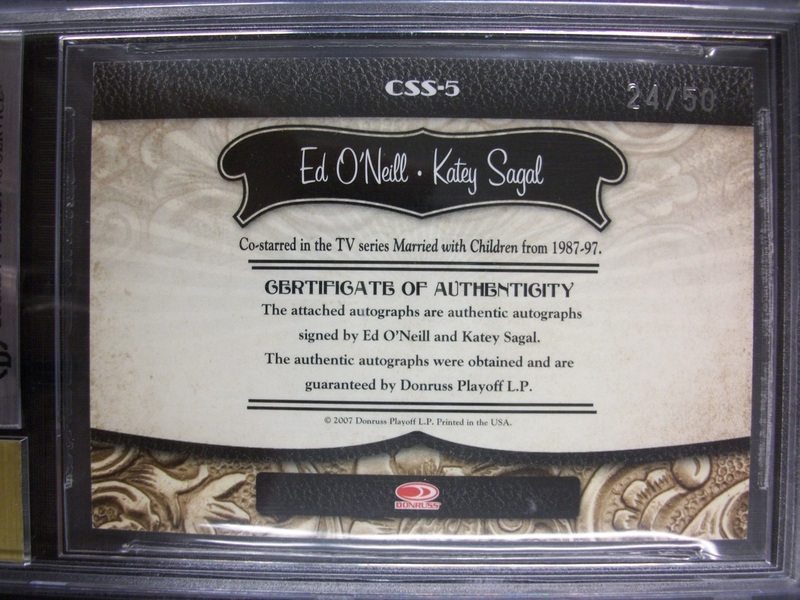 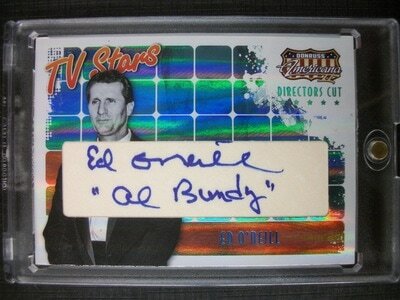 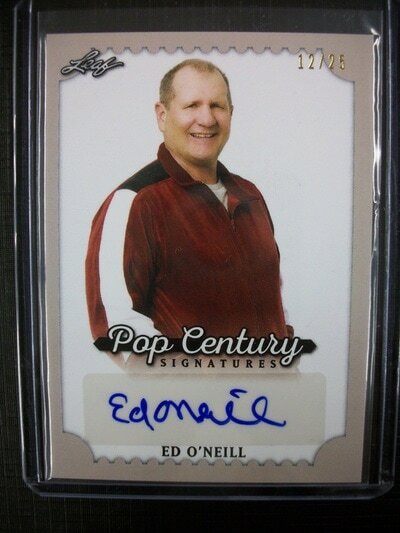 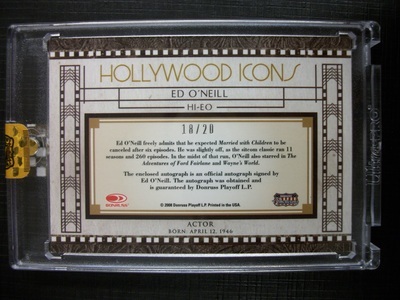 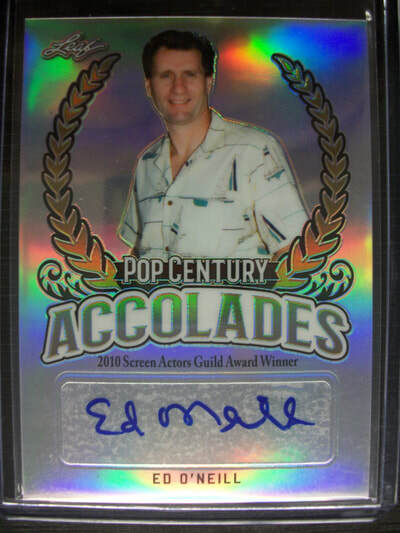 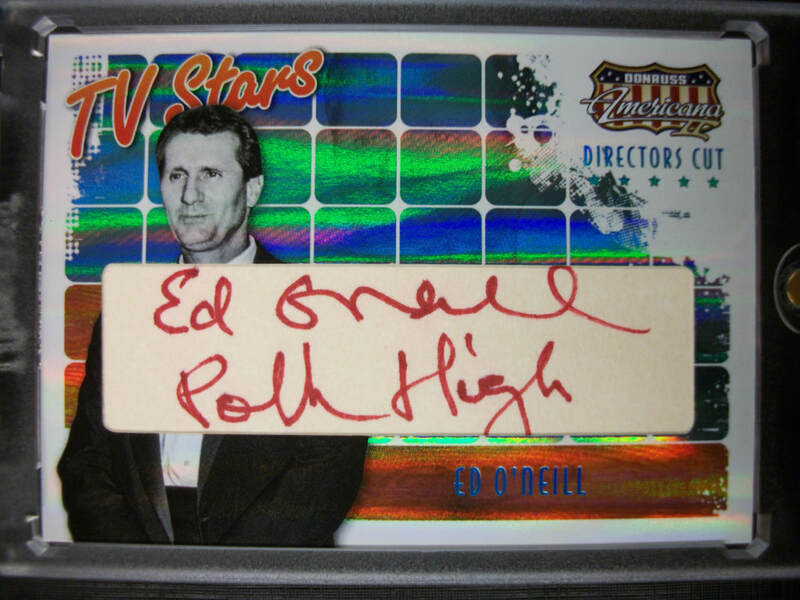 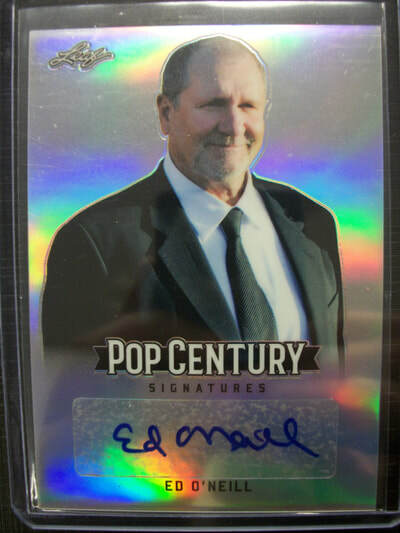 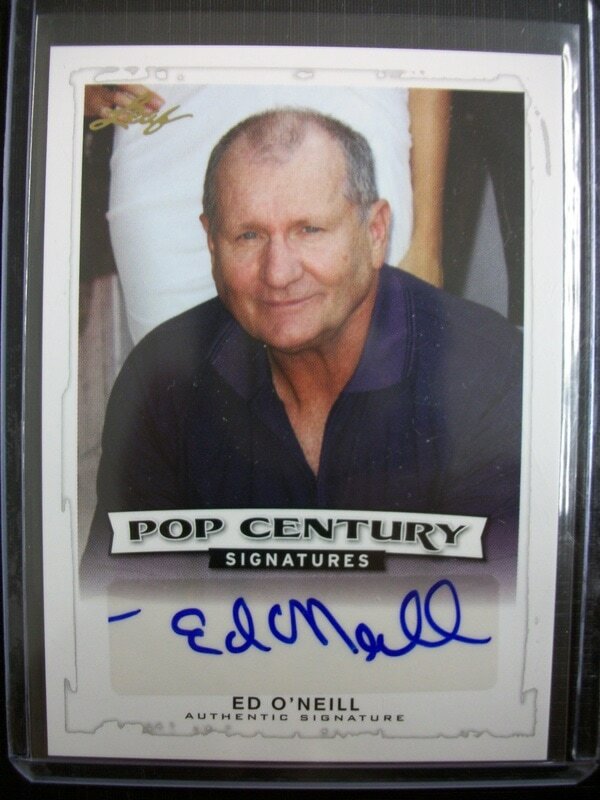 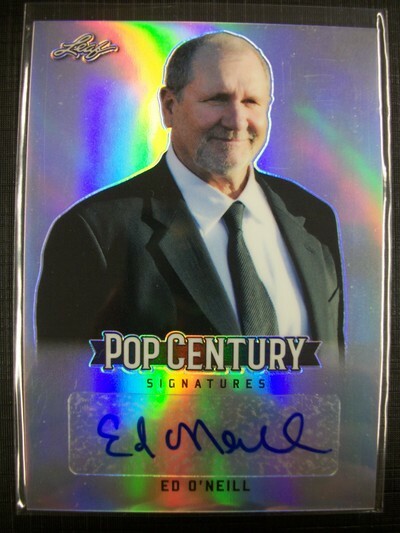 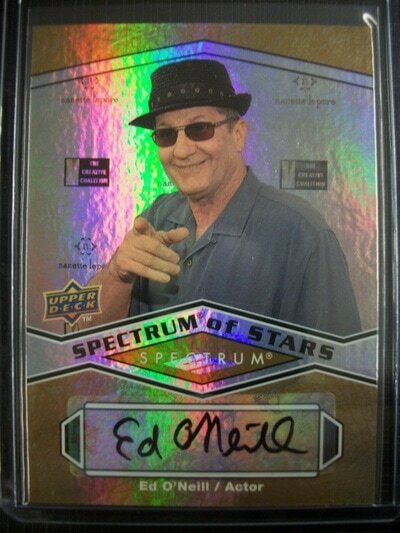 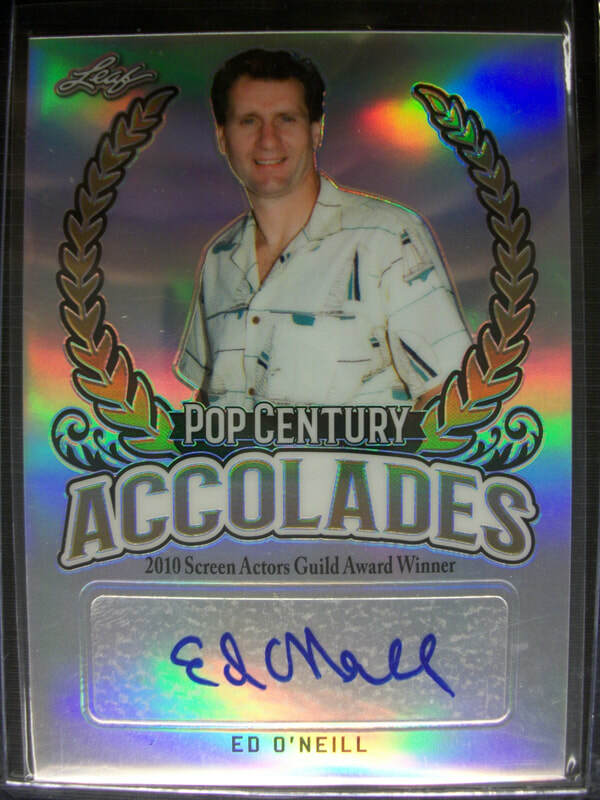 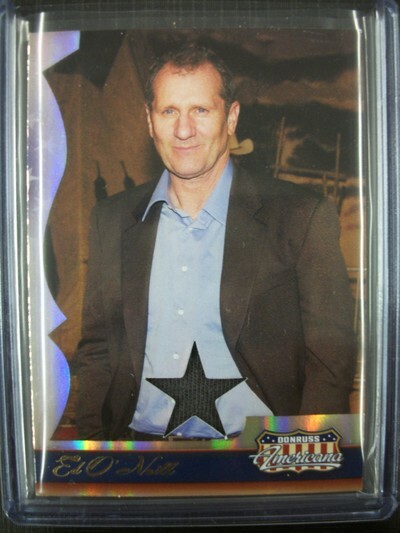 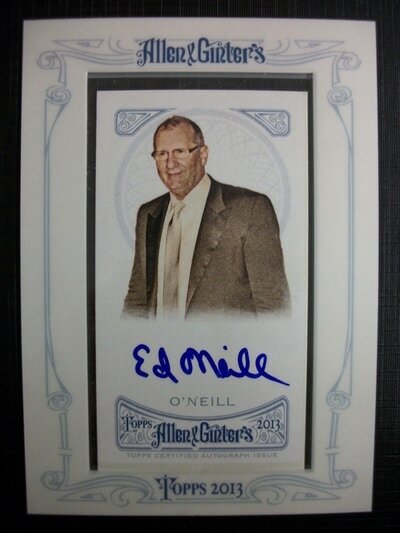 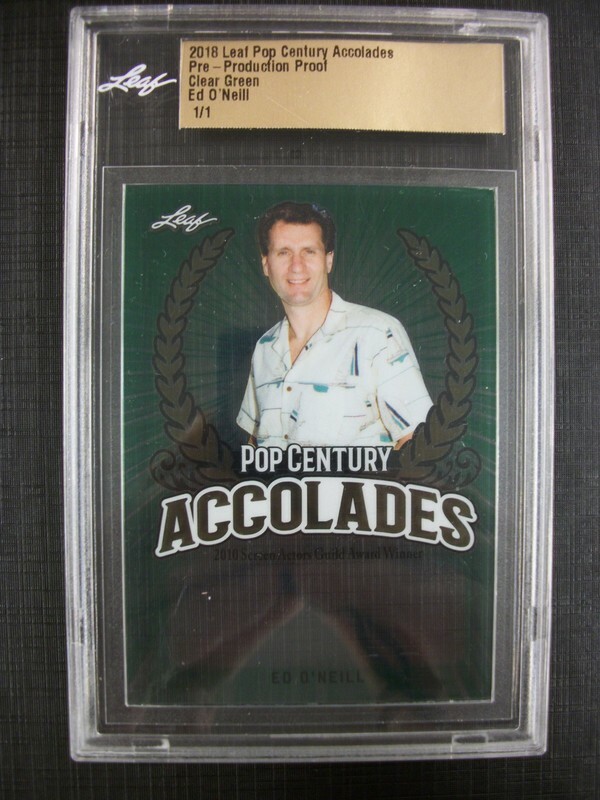 The only licensed autograph card to date that depicts Ed O'Neill as "Al Bundy". 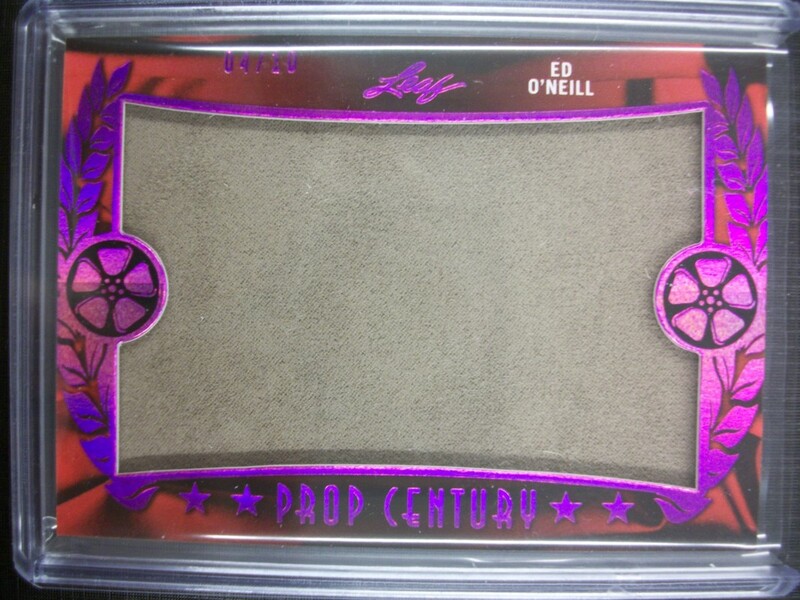 Way to go LEAF! These may be the hardest of Ed O'Neill's "POLK HIGH" related cards to come by. 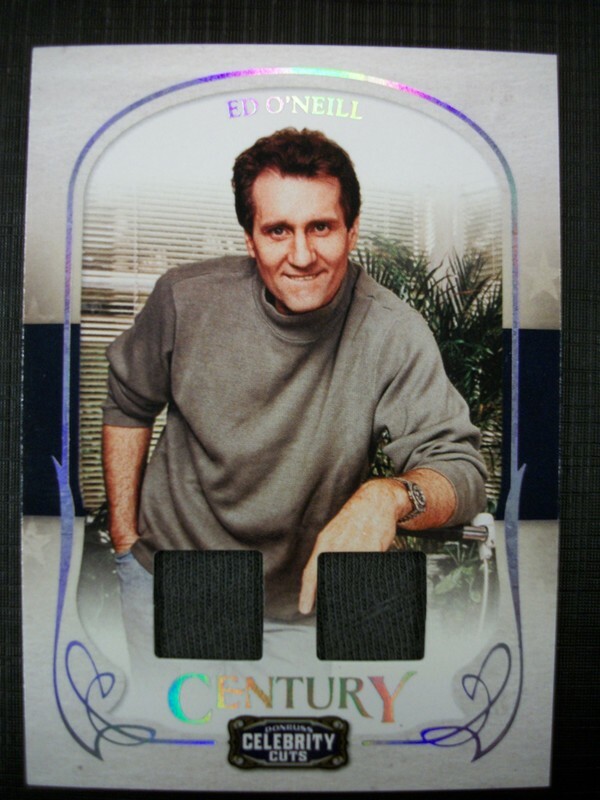 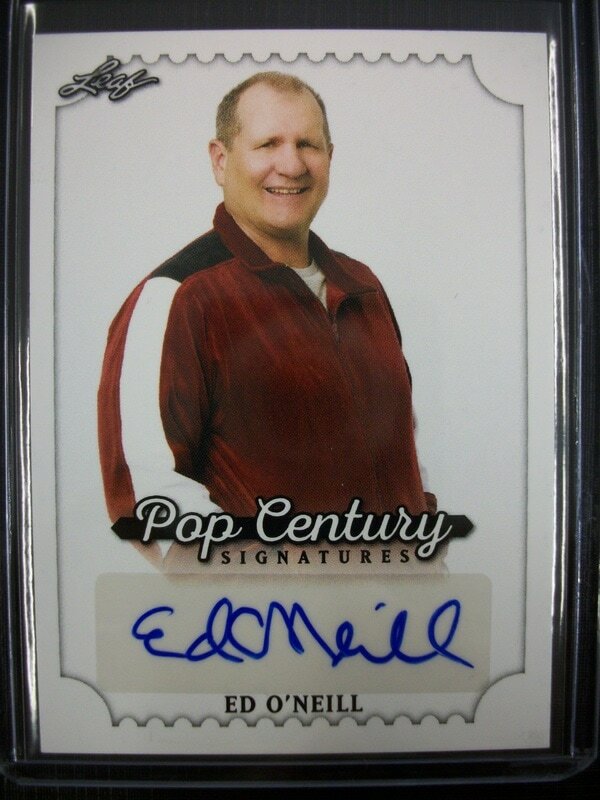 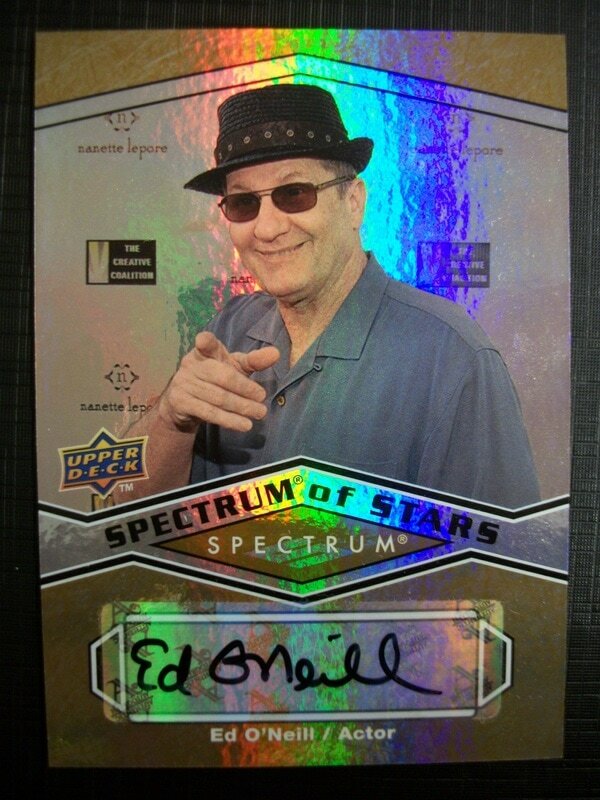 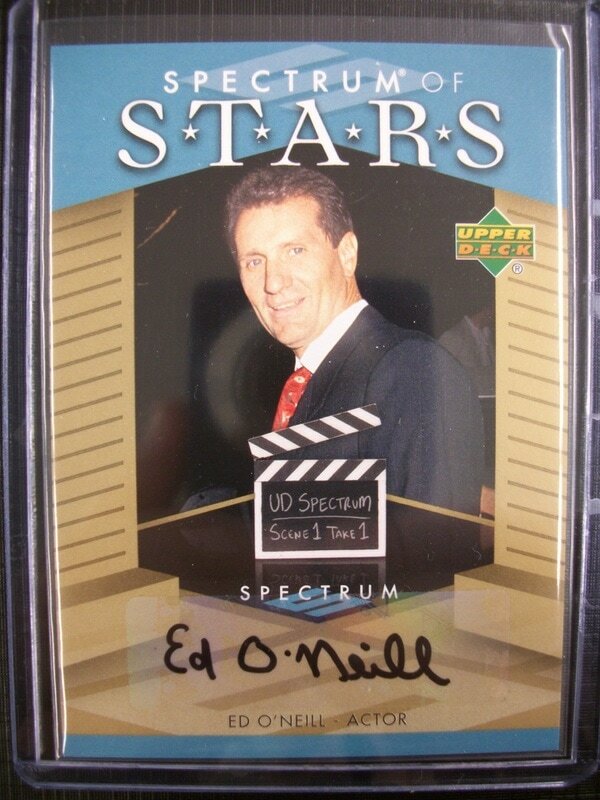 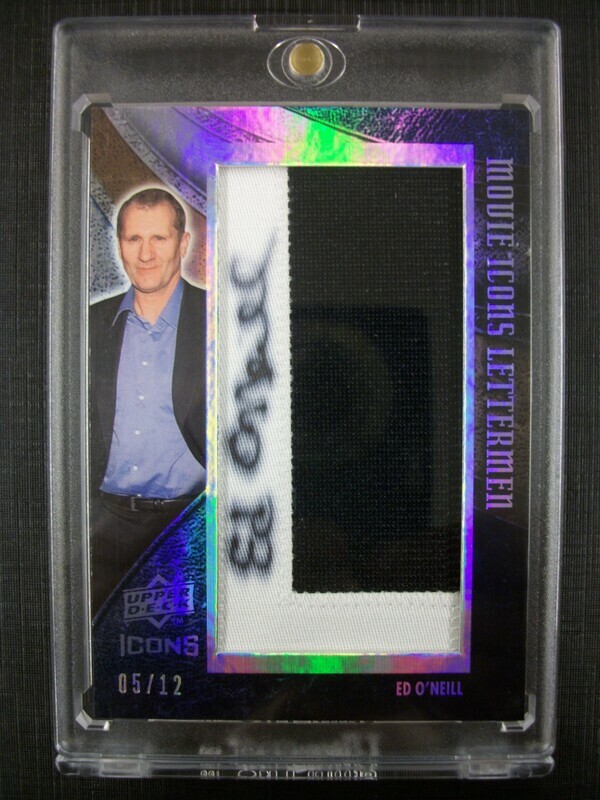 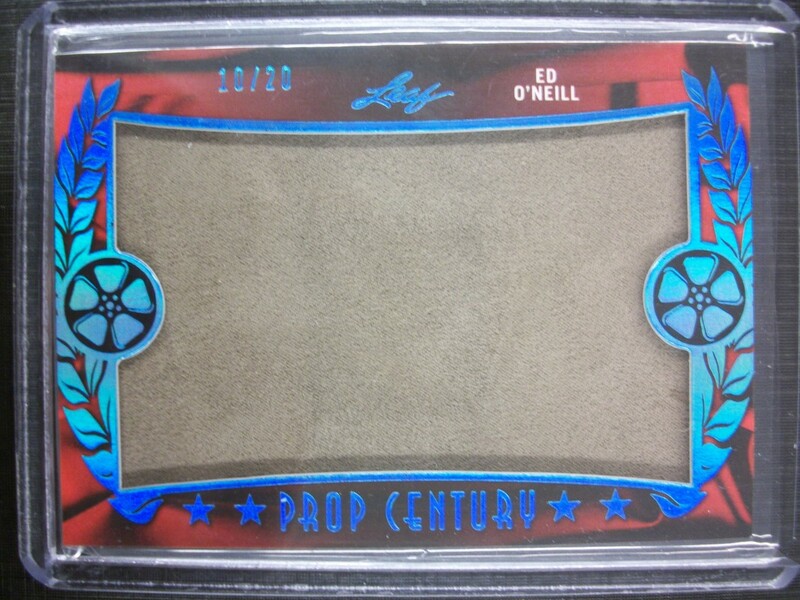 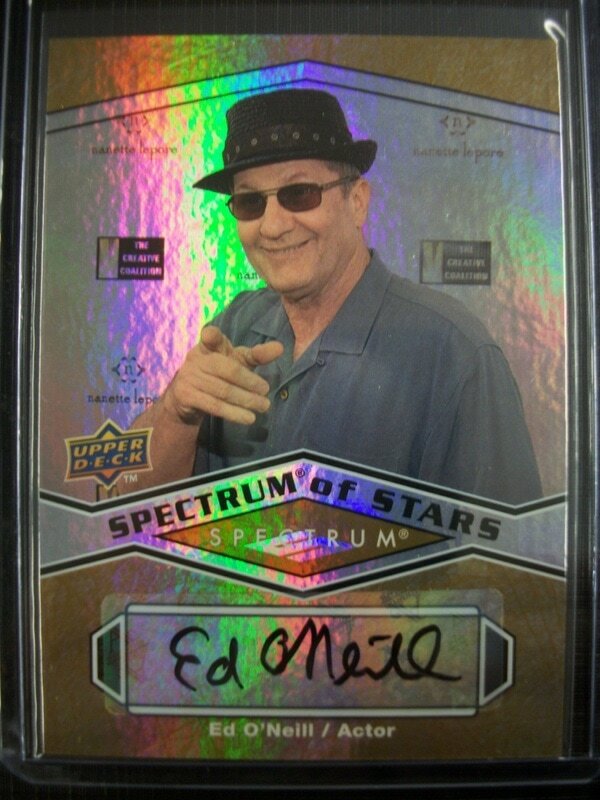 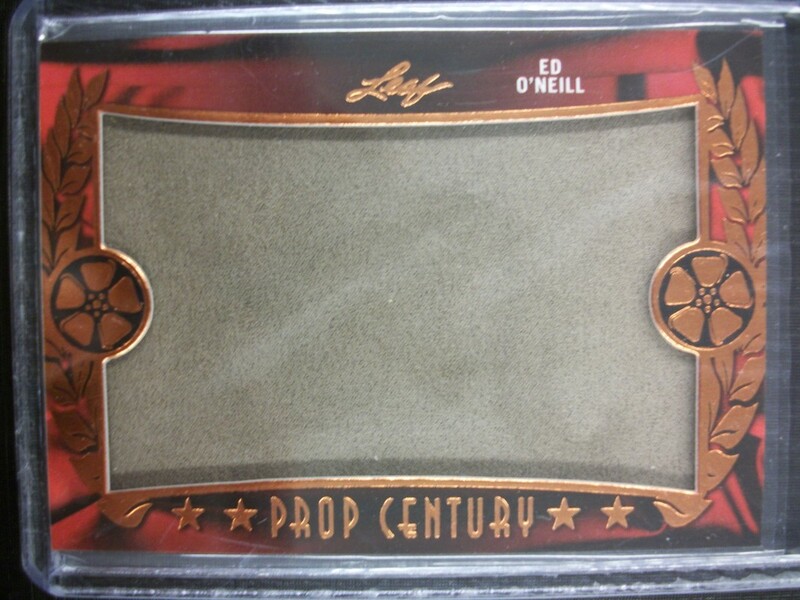 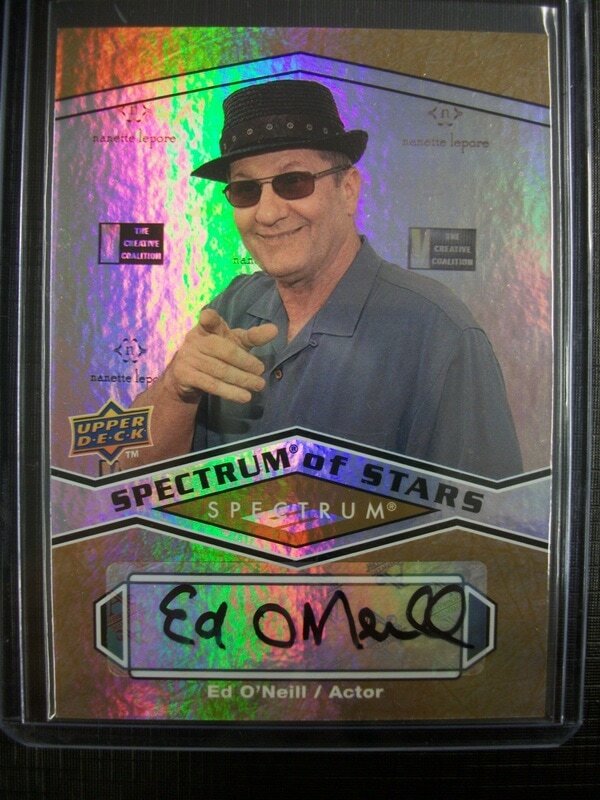 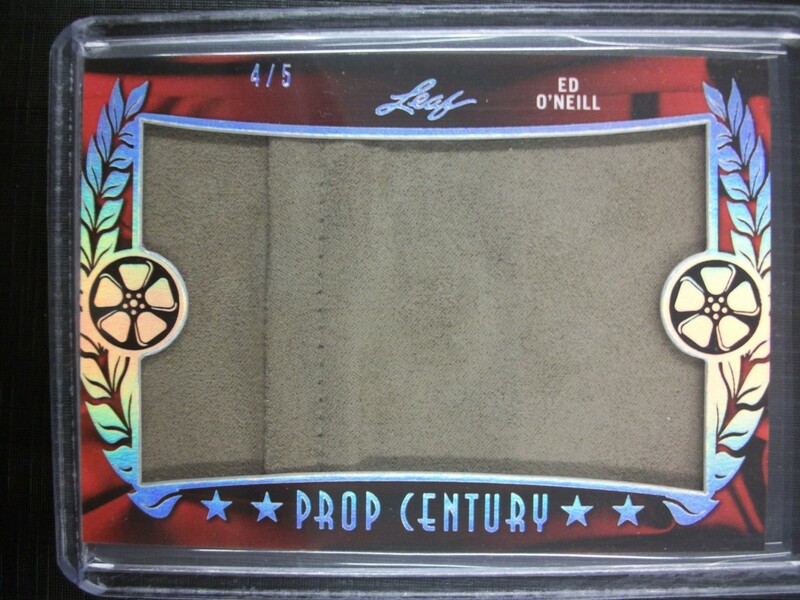 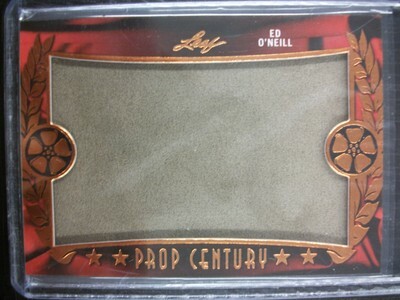 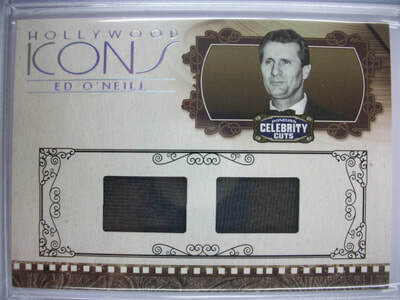 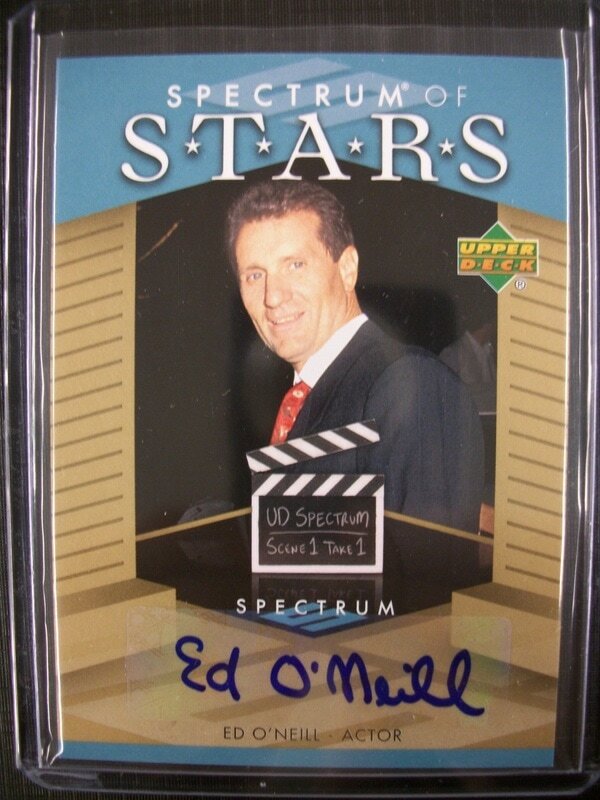 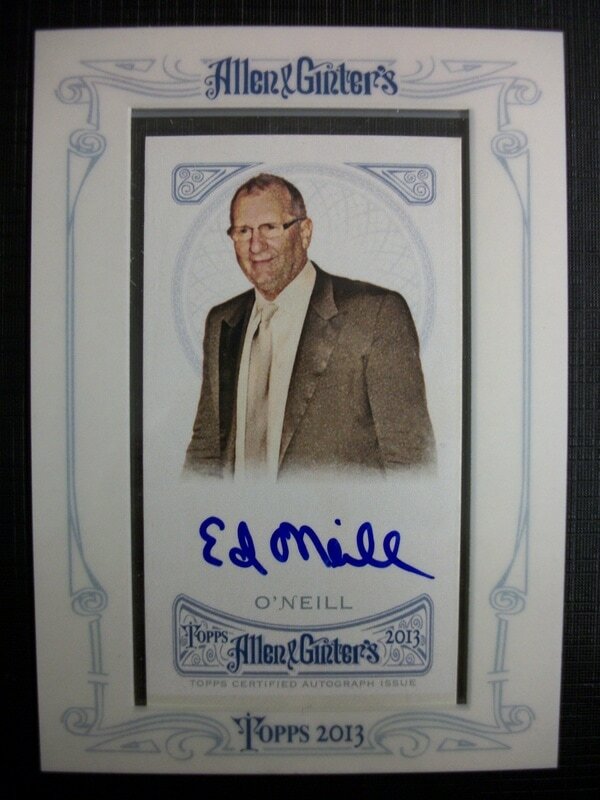 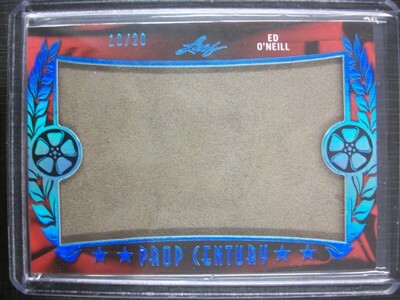 I know of only 1 other (Ed O'Neill) collector who was able to trackdown a complete a set one card at a time. 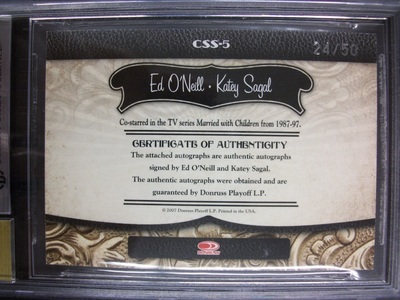 This set is a bit special as all the cards are serial numbered #1/12. 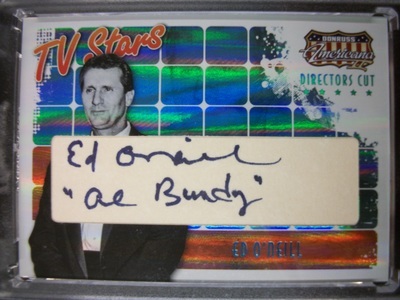 The final "H" is also inscribed "Al Bundy". 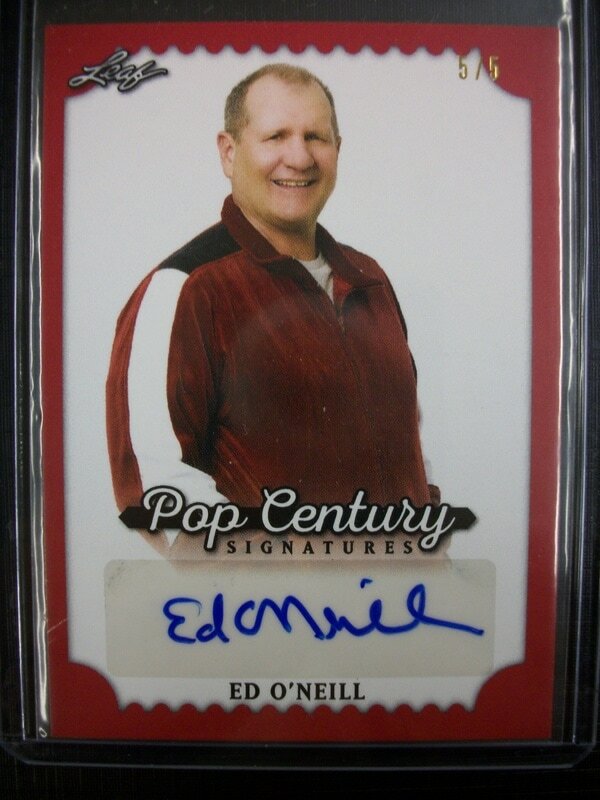 I was also able to track down a couple of additional autographed lettermen cards. 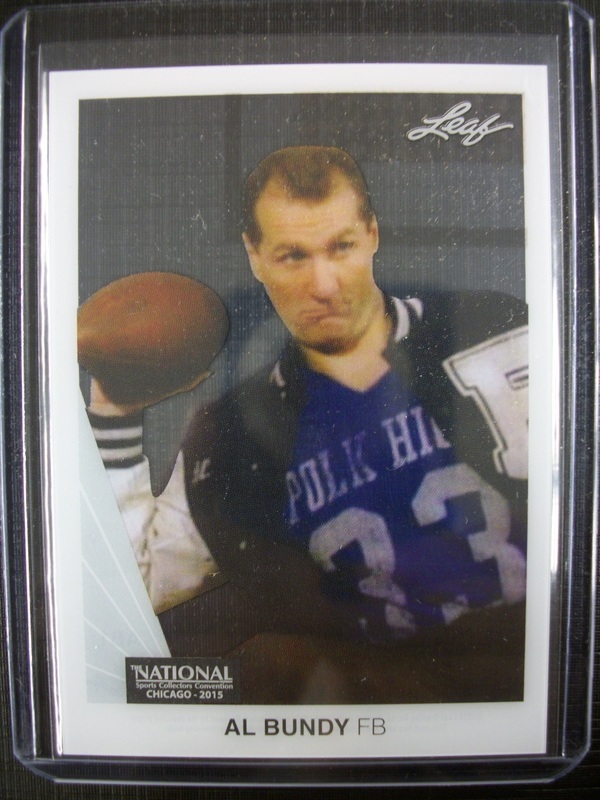 A few non sigend letterman versions that spell out "O'Neill" #/63 and "Polk High" #/30. 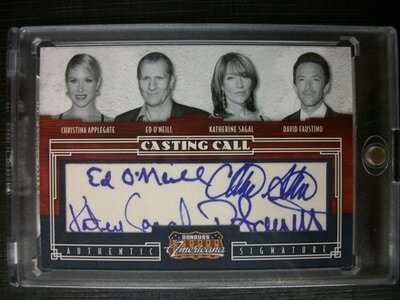 Some personal worn swatch cards of the cast. 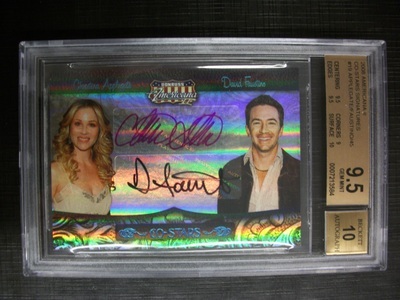 These are not related to the show only the actor/actress. 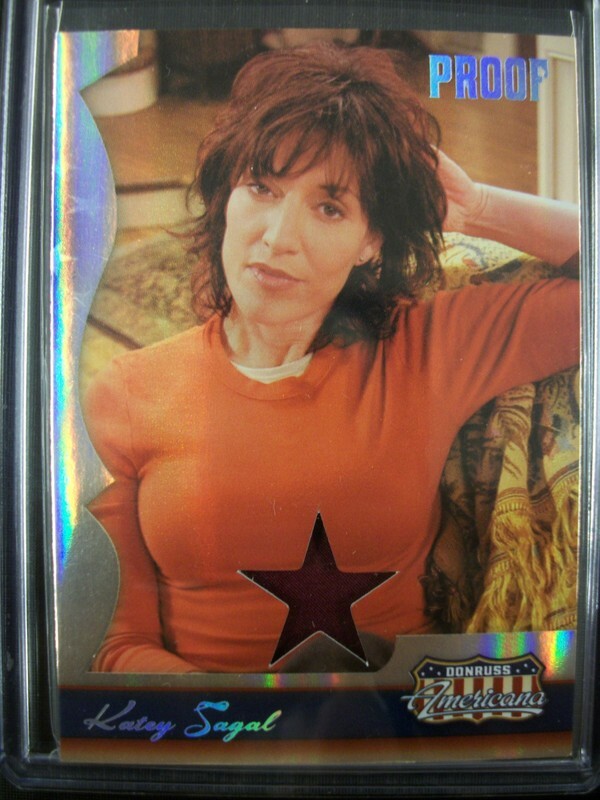 These cards are from the ONLY officially licensed (I believe) Married with Children card set. 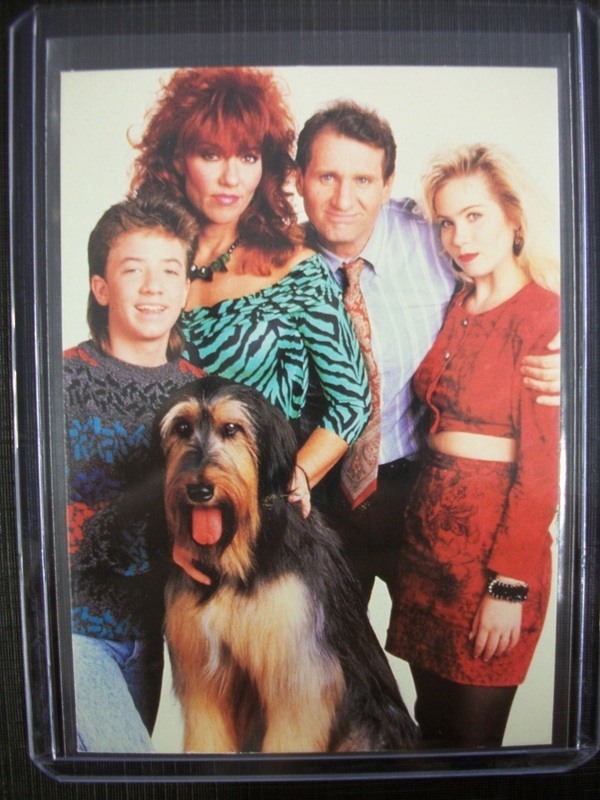 They were made in Germany by a company called Bastei in 1993. 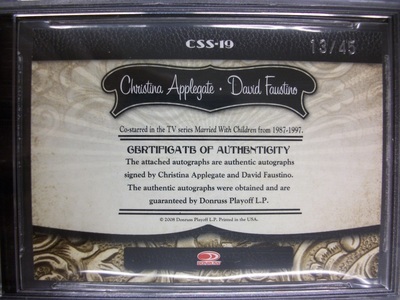 I managed to get a near complete set (188) of a 192 card set. 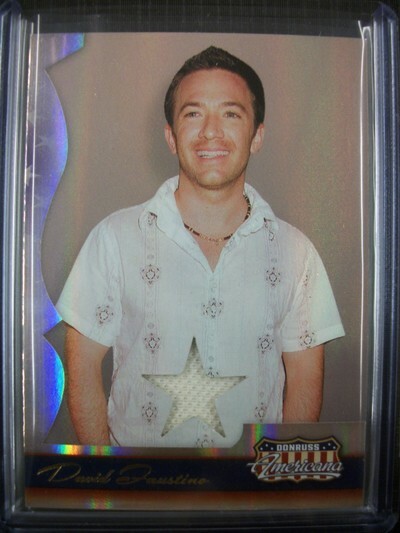 I have over 100 different doubles to trade for the last 4 cards I need. Also looking for any pack wrappers and boxes.....sealed or not. 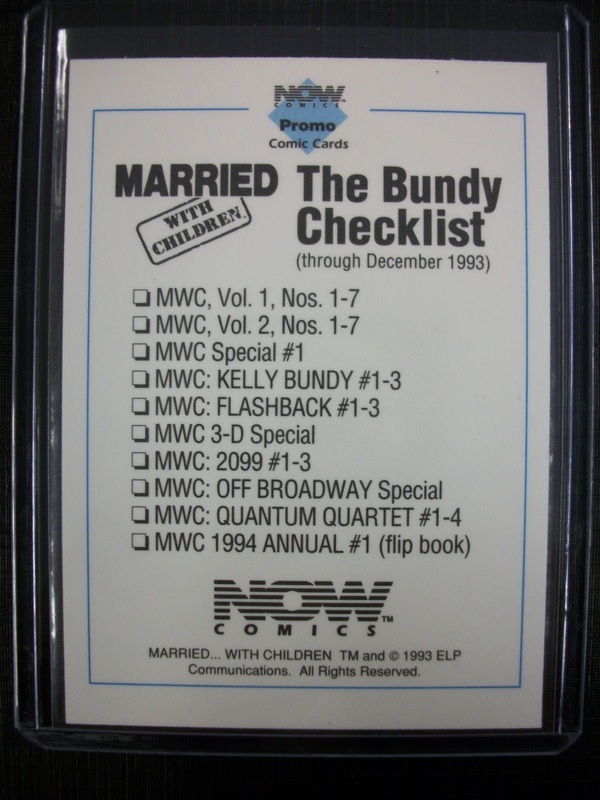 These are the closest to an official MWC card (U.S.) that I found so far. 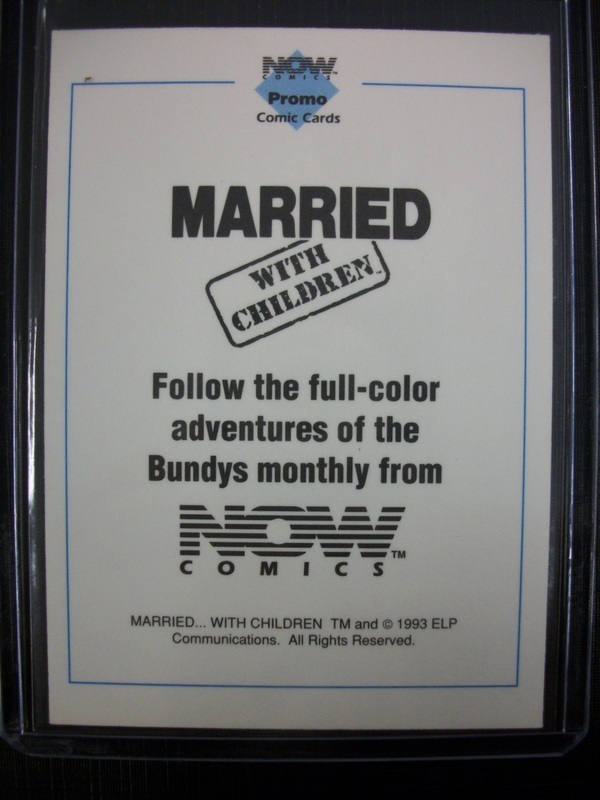 The cards came from a comic book promo for NOW comics that put out a MWC comic book series during the 90's. LEAF trading card company promo for the 2015 Chicago National.